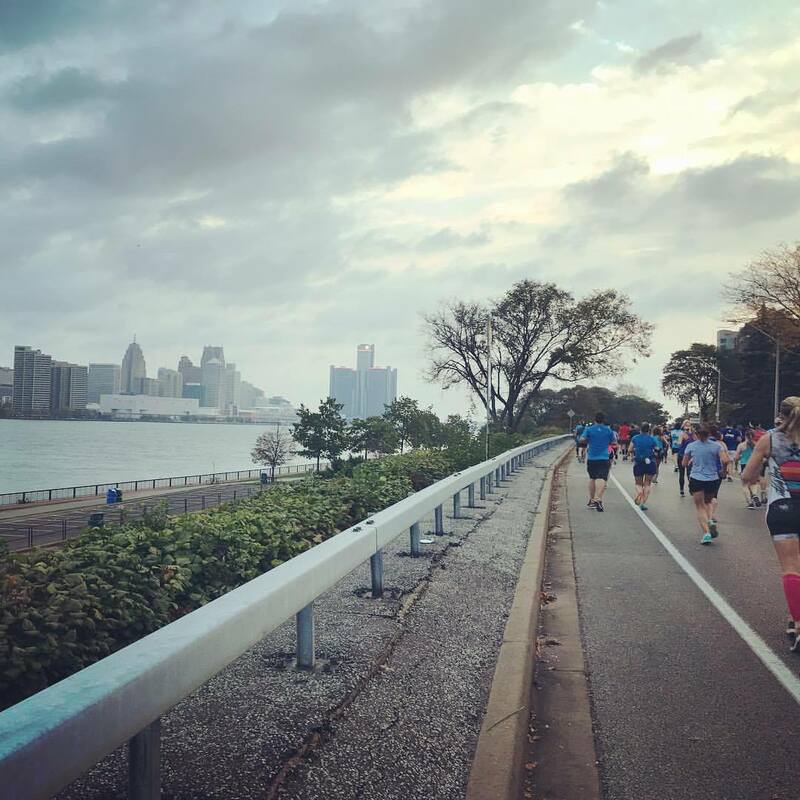 2017 marked the 40th Anniversary of the Detroit Free Press/Chemical Bank International Marathon. So, of course, this year's race was quite a big deal... in fact, last year, friends and I were already blocking out the calendar to include this race for the new year. 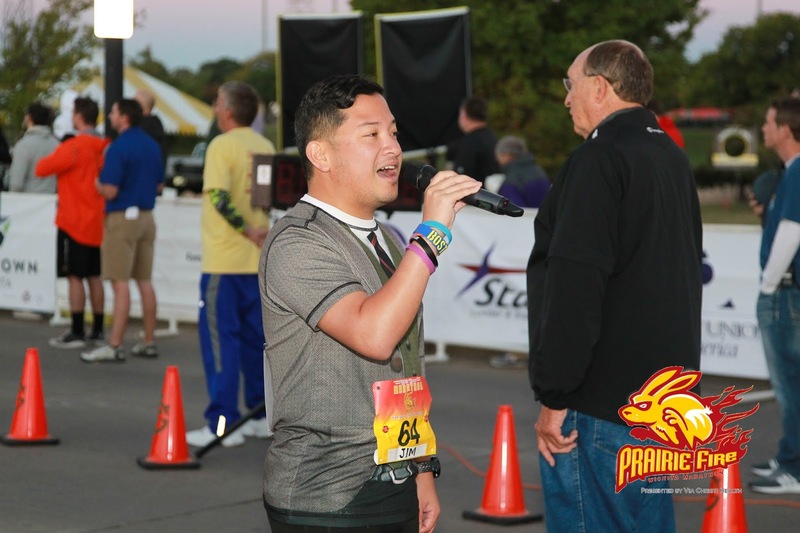 A few weeks after last year's edition of the race had occurred, I reached out to the race organizers to see if they needed an anthem singer for the 2017 race, knowing full well that they likely already had someone in mind for the job. But of course, it didn't hurt to ask. 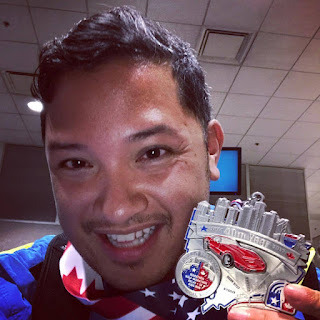 To my surprise, I got a reply email from Leah Yanuszeski, Digital Director for the race, offering me the spot; while they've used the same national anthem singer for the past several years, they loved the idea of my challenge to sing in all 50 states. 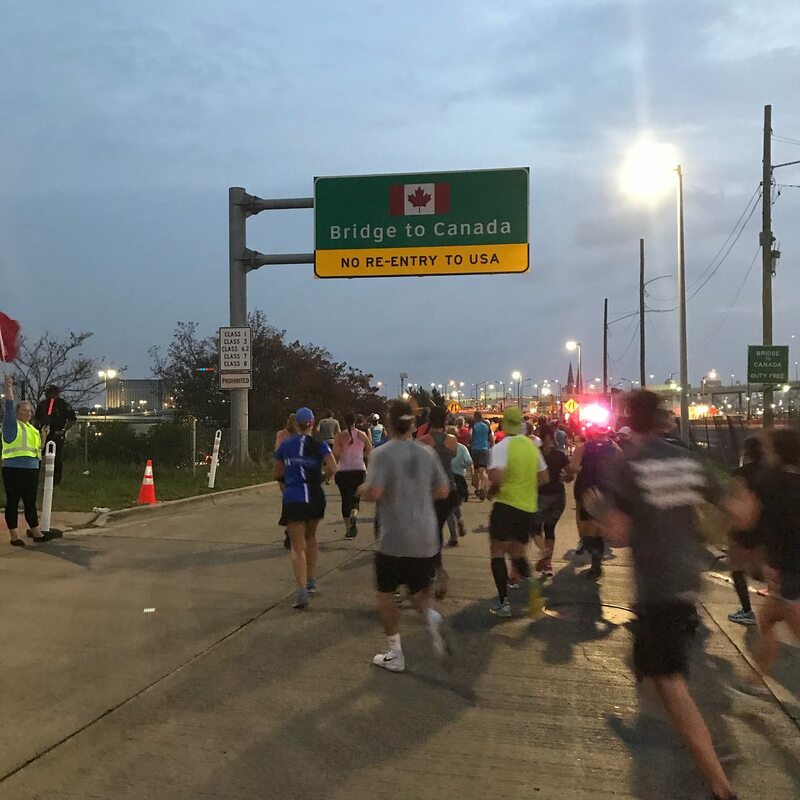 They even asked if I knew "O Canada" as well, since a significant percentage of runners were coming from across the border to run the race. 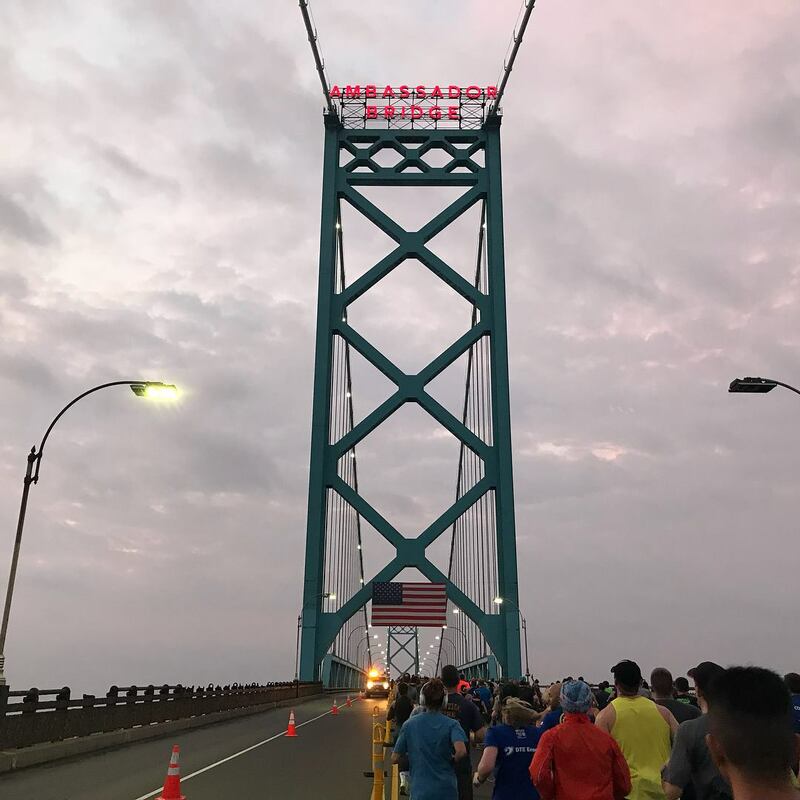 Notably, it is one of the three US races that crosses the international border (the others being the Bay of Fundy International Marathon between Maine and New Brunswick in late June; and the Niagara Falls International Marathon between New York and Ontario, coincidentally happening on the same day as Detroit.) Fast forward to race weekend, and I get jetting off to Detroit on Saturday morning. What should've been a twenty minute bus ride on the Q70 ended up being over an hour due to the traffic slowing to a crawl as it approached LaGuardia Airport from the Grand Central Parkway. As we inched up the onramp, we saw that the entire departures level was blocked off by NYPD and SWAT; we were told they were evacuating Terminal B (the first stop on the bus.) Passengers trying to make their flights who were also stuck in vehicles on the highway were walking along the shoulder of the ramp to the terminal until police stopped them, too, and forced them to board our bus. Turns out, an elderly gentleman allegedly was arguing with an Spirit Airlines employee as he tried to buy a ticket, walked away then returned with a bag and told the employee he had a bomb, forcing an evacuation of the terminal. Only terminal B was affected by this, and runway traffic was moving normally from other terminals. Our bus was then directed to Terminals D and C (my destination), but by the time we’d arrive, the boarding door at my gate would be closed for my flight. Thankfully, as time ticked by while sitting in traffic, I made the decision to call Delta to rebook me on another flight that would leave 3 1/2 hours later. Thank goodness, my status with Delta allows me to make the change for no additional cost, as long as there's room. Also, the bus nearly didn’t make it to the other terminals either-- because of the low clearance and the fact the bus was not taking its normal route from B to D and C, we nearly scraped and top and side of the bus against the concrete bollards and the underside of the onramp above. Our resourceful driver, clearly thrown for a loop but still driving competently and without any hesitations, had to re-maneuver the behemoth, directing cars behind us to give us some space to back up in order to get around the curve. I finally got to my terminal, and decided to get breakfast to pass the time while waiting for my flight to board. I even got some time to work on some race reports while I had some complimentary internet. At noon, we boarded and it was a quick 80 minute flight, and we even landed early in Detroit. I picked up an Uber from the terminal's Ground Transportation Center and made it the Cobo Center in downtown Detroit for the expo by 3pm. While there, I got to see friends Barb and Donna (another friend Lynn was back at the hotel napping), and my contact with the race, Leah. An old college friend Nicky, who is a volunteer coordinator for the marathon, met up with me as well - she had messaged me a few days earlier when she found out that I was singing the national anthem at the start! After getting through the expo, we headed back to the Westin, where we were staying Saturday night. Lynn had woken up and we were then off to have dinner in Canton (about half an hour away) at the home of another friend, Jeff! Meeting up with my college friend Nicky. 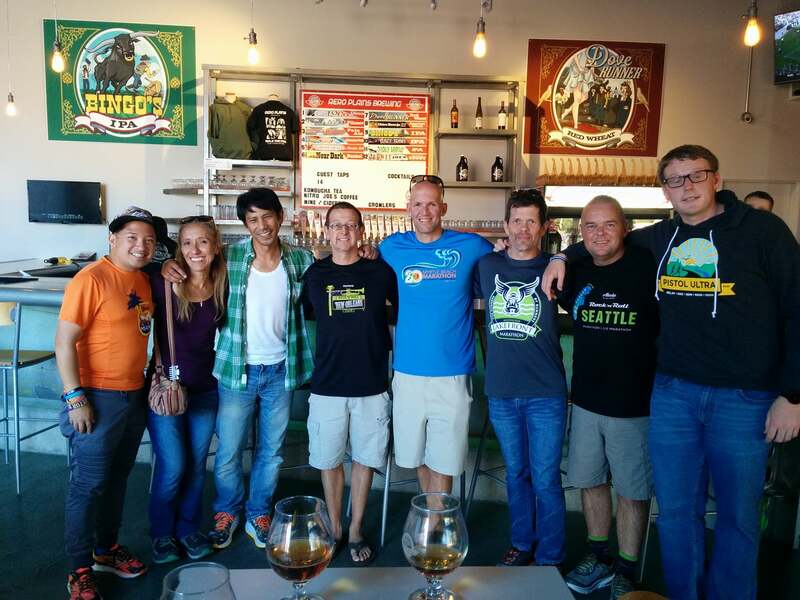 Dinner was fantastic, as was the company with lots of friends old and new who were in town from all over to run the race. The weather got soggy as the sun went down, and it rained the entire time we were there and on the way back - we got back to Detroit before 9pm, and settled in with one quick trip downstairs to visit with a couple more friends socializing at the bar, before heading off to bed since I had set my alarm for 5:15 the next morning. 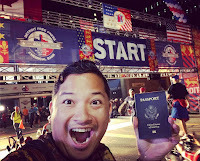 I promptly woke up to my alarm and got myself ready and out the door a little before 6am, passport in a plastic bag and secured in my waist belt (yes, I had to run with my passport! ), heading downstairs to a lobby full of runners getting ready for the race. I went down the street to the start line and to Gateway Deli, where the marathon was having a continental breakfast for VIPs. Already, I could tell the wind had picked up significantly from the day before, becoming more sustained. Luckily the pre-sunrise sky showed no significant cloud cover that could signal impending thunderstorms. The discussion all around seemed to be how worried everyone had been about the weather - in Michigan it can change on a dime, and this weekend was no different; the forecast the day before showed thunderstorms for Sunday morning, and the race organizers issued an advisory that if lightning was spotted within 7 miles of the course, they'd cancel. 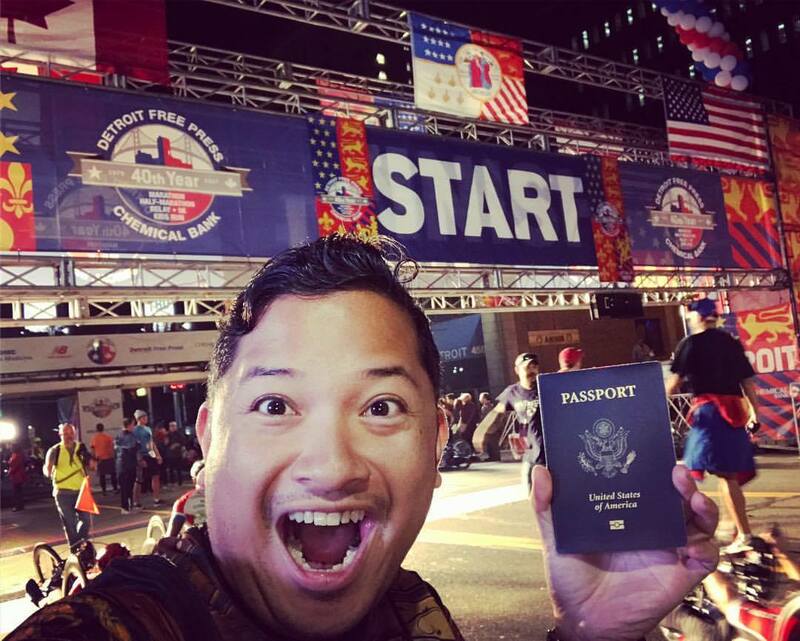 After gulping down a small coffee pick-me-up, I headed to the start area which was already beginning to fill with wheelchair runners and handcyclists with the runners assembling behind them, and found my way to race officials who directed me toward the start stage. I met some executives from lead sponsor Chemical Bank while waiting, and turned out that one of their daughters was at Michigan for architecture school around the same time I was while their other daughter was in a collegiate co-ed a cappella group at Michigan as well as a semi-pro co-ed group in New York City. Donna and Lynn met up with me near the start, and after a little bit of miscommunication (the start line logistics folks didn't realize I was standing right there next to the stage), I went up to the platform, and was introduced by Executive Race Director Barbara Bannage before singing the Canadian and U.S. National Anthems to 15,000+ runners and countless others watching the race start. As soon as I was done, the three of us moved up the crowded sidewalk toward the further back corrals, like fish moving upstream. I decided to just cut into the corrals and join the runners in corral D, and at 4 minutes after the hour, I was off running southwest down Fort Street, still under a dark sky, but one that was getting brighter by the minute. The wind was there, but not strong... and you could feel the saturation in the air - it was 70° with 88% humidity. People were out in droves cheering for us for the first couple of minutes of the race, but just like that, it was pretty quiet again. 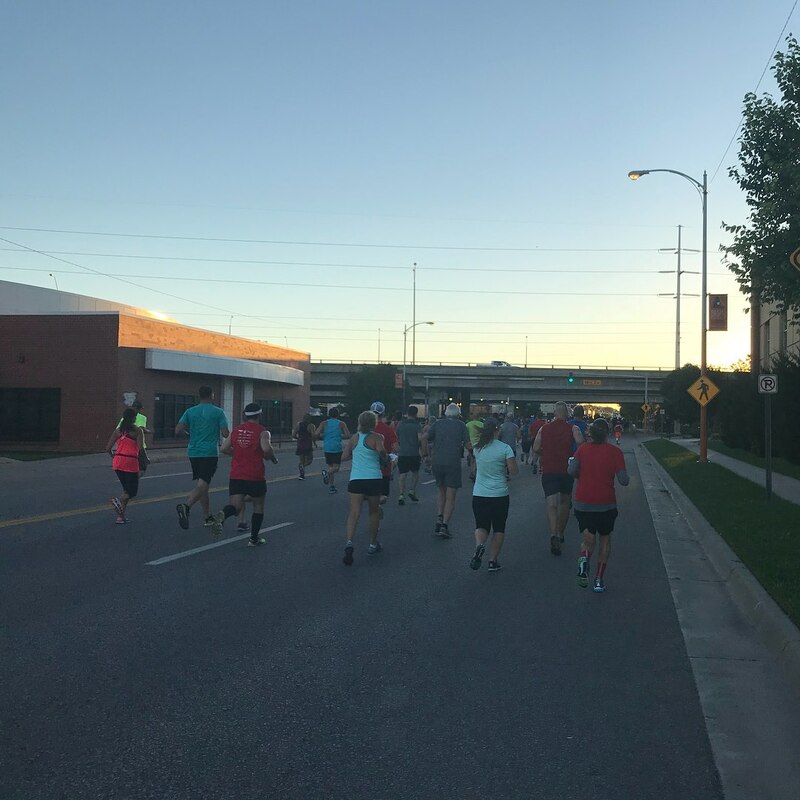 We ran for nearly two miles down Fort Street, as the street scene began to turn progressively more industrial. In the distance, we could see the Ambassador Bridge, lit up in the pre-dawn sky, already teeming with truck traffic held up to accommodate the runners. We could tell it was a warm morning, as well, because I was sweating up a storm. Soon we made a right turn, and we began the gradual ascent along a service road of the Fisher Freeway (I-75), to take us around a loop that went through the truck entrance and Duty Free Plaza of US Customs and Border Protection, a massive concrete area that was barricaded off for runners, as trucks were lined up on a wide berth from the two interstates that feed onto the bridge. 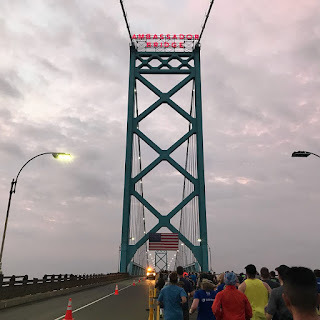 The light up message screens above each lane showed support for the runners making their way onto the bridge. We then began our real ascent, making our way up the steep upramp along the right side of the bridge, reaching the 5k mark. And boy, was it steep! I found myself having to walk quite a bit as we made our way up, about 152 feet of ascent over .75 miles. The view was extraordinary, especially with the dawn sky - and the clouds dissipating (thankfully) over Canada, with the sun peeking through. It wasn't terribly windy as I thought it would be. 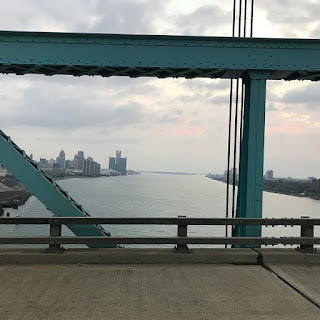 Seeing both the Windsor and Detroit sides of the bridge over the Detroit River was fantastic. I enjoyed the nice lengthy downhill right up until we made the turn around at the bottom of the hill and past the border patrol booths onto Huron Church Road. 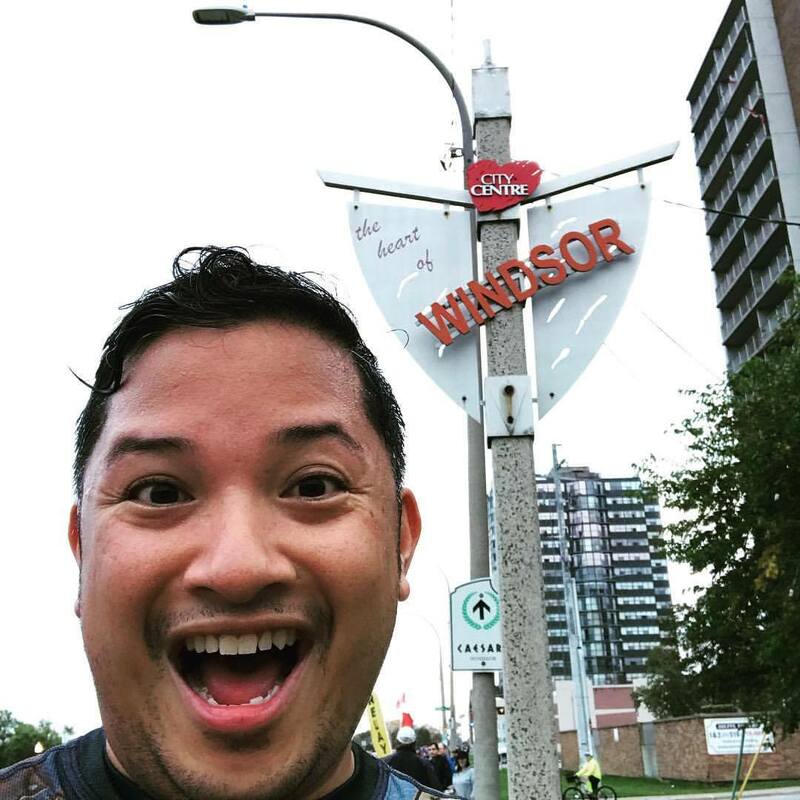 We were in Windsor, Canada! 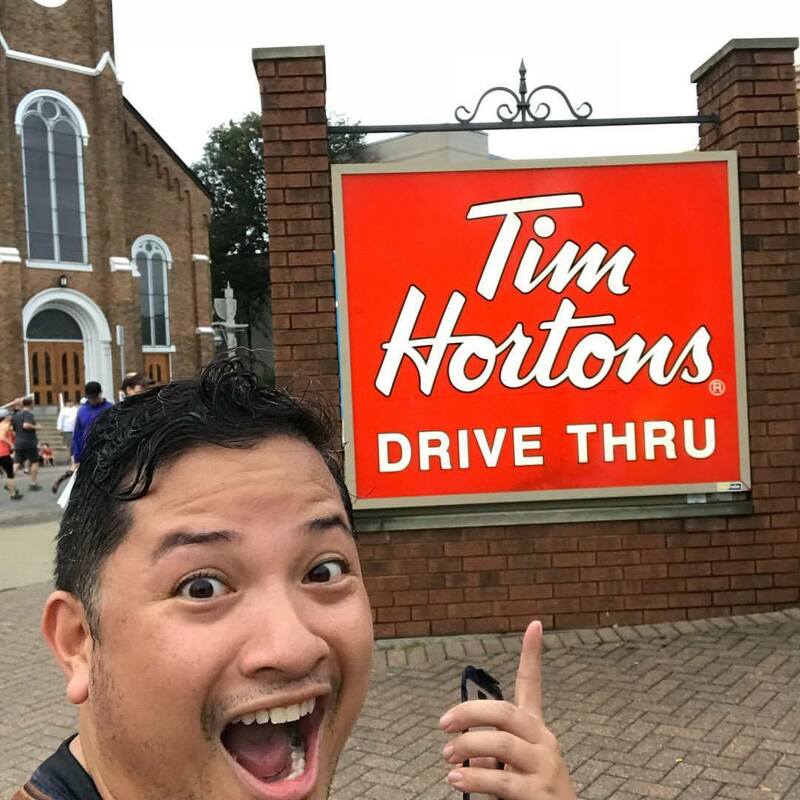 This place has some history with me, as it was where a 19 year old Jim went with friends from college for a night out, as the legal age to drink in Canada was 19, and not 21 like in the US. The stretch along Huron Church Road was filled with plenty of people cheering us on, many with signs welcoming us to Canada (...eh!). We passed the University of Windsor before making a turn onto the Riverside Drive, hitting the mile 5 marker, and continuing down a nice flat section right up against the Detroit River which we would run along for the next two miles. 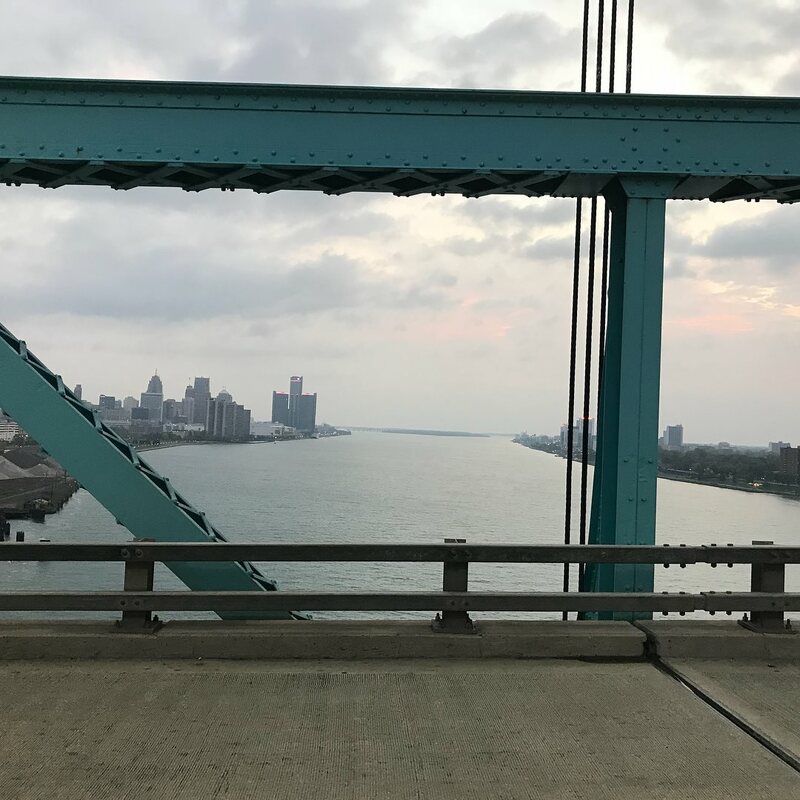 The views across the river to downtown Detroit were quite beautiful. The wind had picked up a bit more, evident from the large Canadian flag on our side of the river waving wildly in the distance. 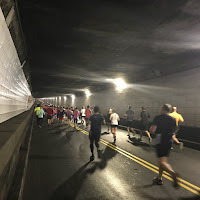 We turned right onto Goyeau Street, running down several spectator-lined blocks as we got closer to the entrance to the tunnel. 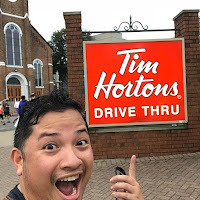 We turned another corner that happened to have a Tim Horton's on the corner, and I stopped to get a photo - they're as ubiquitous in Canada as Starbucks and Dunkin' Donuts is in NYC! Before long, the road narrowed and we were funneled into the unassuming entrance of the Detroit-Windsor Tunnel, a mile long trip underwater across the Detroit River - and likely the only underwater mile in a marathon in the entire world. The trip across the tunnel was rather uneventful - in fact, the first half of it was rather quick, as it seemed that we were on a slight downhill. But the lack of air was quite evident, and it made the run through the tunnel very stuffy. I felt like I was sweating up a storm as we made our way through the tunnel. Halfway through the tunnel was the demarcation spot indicating the Canada side and the US side, and like many others, I stopped to grab a photo as we made our way past. One would barely be able to see this if they were driving through the tunnel, so it was nice to be able to snap a picture before continuing on - this time on the uphill that took us right back to Detroit. At the border during the underwater mile! We emerged out of the tunnel and felt the breeze, effectively blowing away all the sweat from my brow. 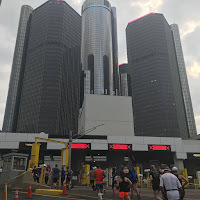 The roadway looped around in the shadow of the hulking "RenCen," as Michiganders refer to the GM Renaissance Center as, probably THE definitive building in the Detroit skyline. The group of seven interconnected skyscrapers rises 73 floors in its tallest building (the central tower housing the Detroit Marriott at the Renaissance Center, the second tallest all-hotel skyscraper in the Western Hemisphere), and is famous for its cylindrical design and rosette configuration. As we made our way past border patrol officers and greeted back into the US with spectators lining the sides of the streets with "welcome" signs, we continued on down Jefferson Avenue, heading through the road that cuts right through the Cobo Center, to the cheers of throngs of spectators. This easily was the most dense crowd support area of the entire course. We continued along Jefferson Avenue, making our way past Joe Louis Arena, the recently closed (this year) home of the Detroit Red Wings, which will be demolished and slated for redevelopment in the near future. Passing the West Riverfront Park alongside the river, we made a slight right turn, curving up along Rosa Parks Boulevard, where we encountered a short three block out-and back section. After the out-and-back, we turned right onto Lafayette Boulevard, as we hit the 10 mile mark. We then weaved our way through Detroit's Mexicantown, passing by the beautiful Sainte Anne de Detroit Catholic Church, the second oldest continuously operating Roman Catholic parish in the U.S., which stands majestically along the course at 18th Street, as runners head north for a few blocks, before turning right onto Bagley Avenue as they make their way toward Corktown. 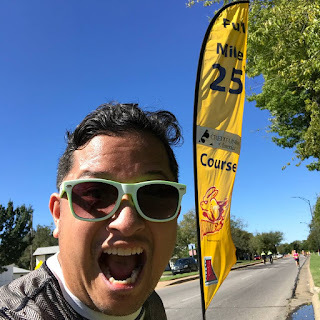 At mile 11, I decided to make a quick stop at the medical aid station to get some Tylenol, hopefully to ease the pain in my right foot that had been an issue at the end of the Prairie Fire Marathon the week before. They gladly obliged, and soon I was on my way. 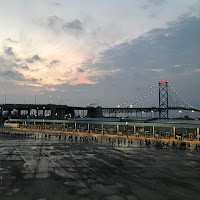 We crested a bridge that went over the train tracks that passed through the city, as well as a semi-obscured rear view of the abandoned Michigan Central Station rail depot that was the former intercity passenger rail depot for Detroit until the late 1980's. Also happened to see the most inventive spectator sign I've seen in some time as I went over the bridge! We weaved our way around Corktown, a largely residential historic district of southwest Detroit that used to be the Irish "mecca" of the city, travelling south on Trumbull Avenue. Just before turning again onto Porter Street, a spectator brandishing a microphone and portable speaker was singing some standards and began to sing a little Frankie Valli and the Four Seasons, and I ran up to him and decided to harmonize a little with him on "Can't Take My Eyes Off of You" for a verse and a chorus. He loved it, as well as the other spectators around him! 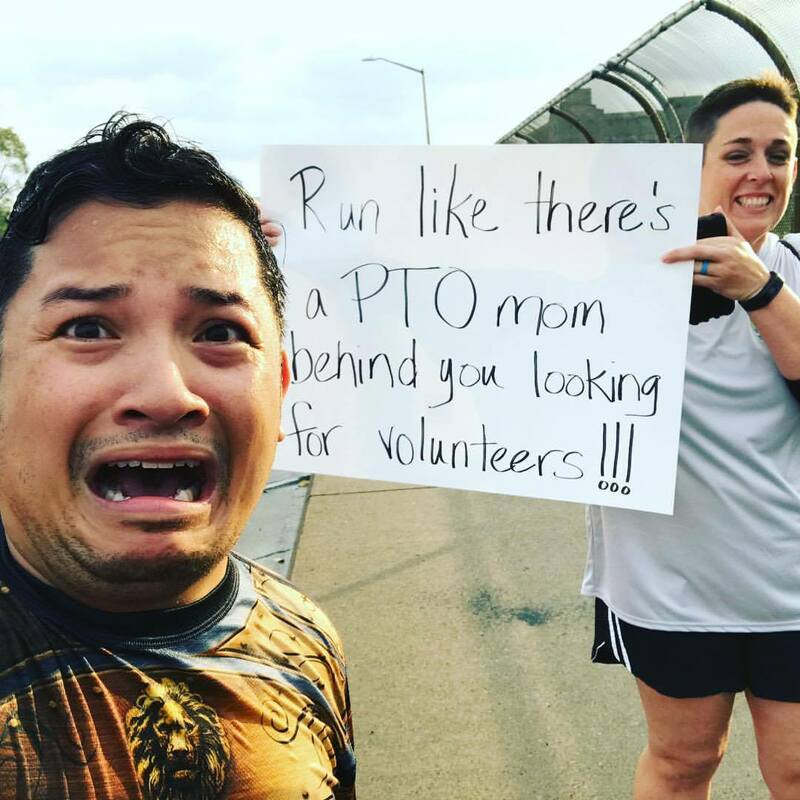 I thanked him and continued on in my run. Eventually, we were on Michigan Avenue, a wide avenue that serves as one of the six main "spokes" in Detroit's hexagonal street configuration, designed by Augustus Woodward after the historic fire of 1805. 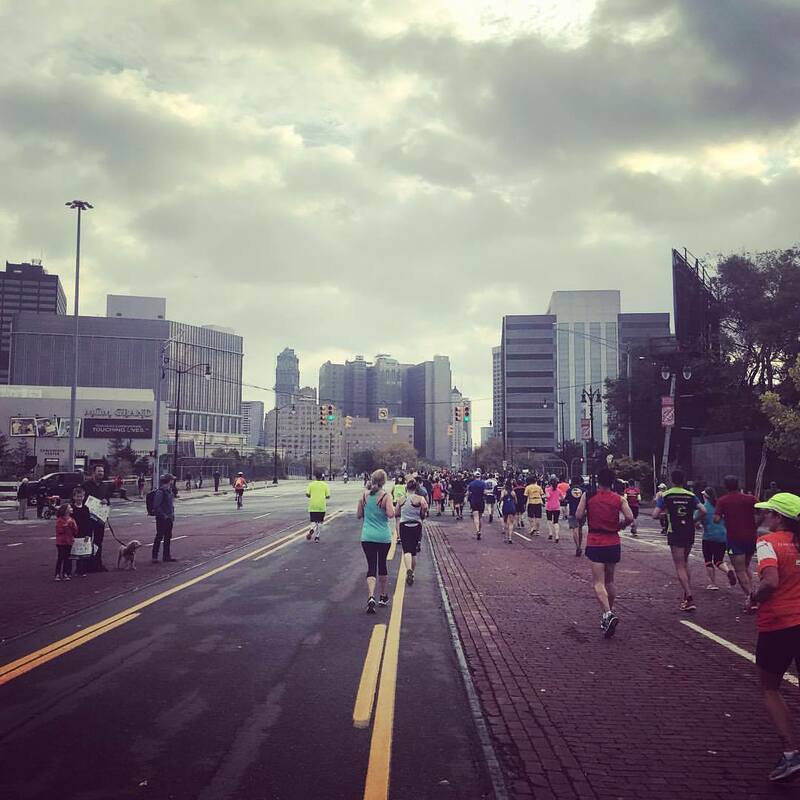 The crowd support here was phenomenal, as we were approaching the final mile of the half marathon, running back through downtown. 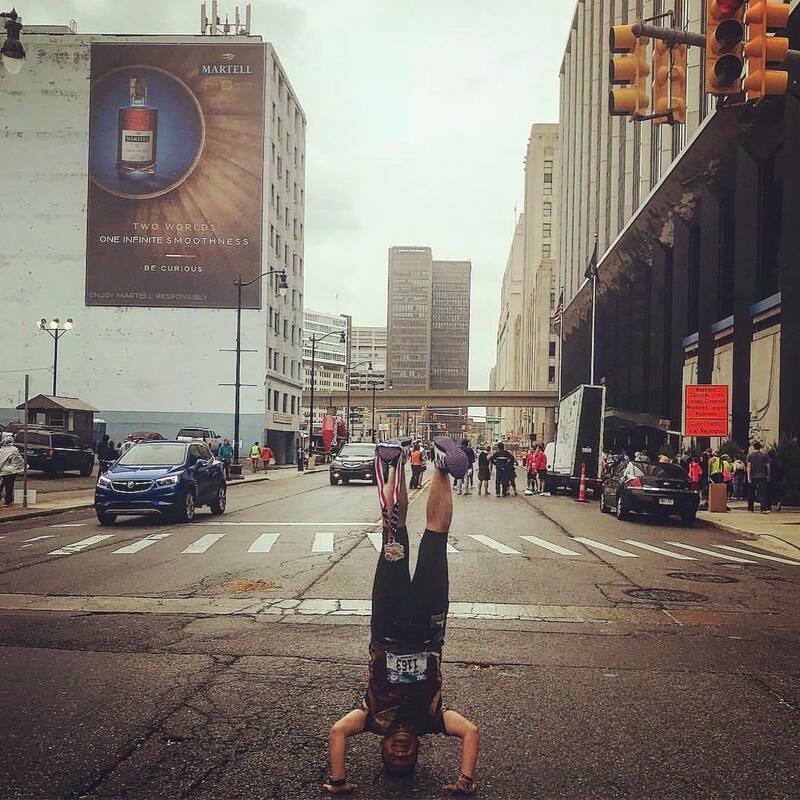 The atmosphere was electric, as all around us the skyscrapers of downtown Detroit became part of the course. 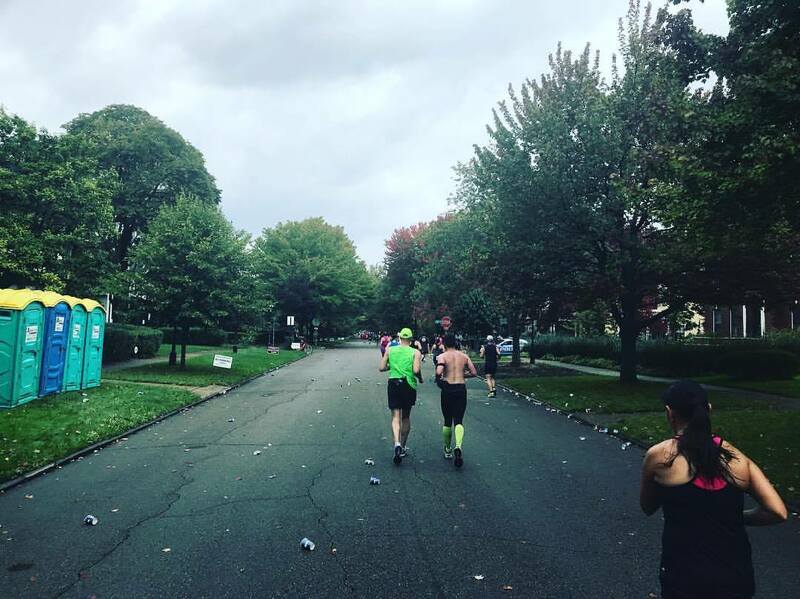 We turned right onto Griswold Street, and within a couple blocks, they were separating the half marathoners to the right and the marathoners to the left. The half marathoners had one more right turn and before them was the finish line. We, however were only halfway done. 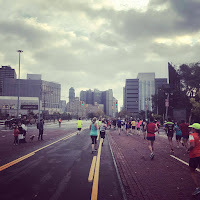 We turned left onto Congress Street and began to run away from downtown. 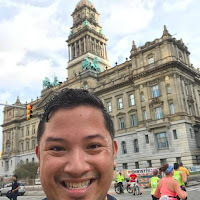 The cheering petered out almost immediately, as we passed several iconic art-deco and Beaux Arts style buildings smack dab in the middle of downtown Detroit, including the beautiful Wayne County Building. We also passed by the Greektown commercial and entertainment district and its eponymously named hotel and casino, before passing underneath I-375 and turning left onto Rivard. We then began our lengthy northeasterly 2.5 mile trek along Lafayette Street, passing through the urban renewal neighborhood of Lafayette Park (and its post-World War II superblock developments designed by famed German-American architect Mies van der Rohe) and Elmwood Park, before reaching the leafy residential neighborhood of Indian Village. 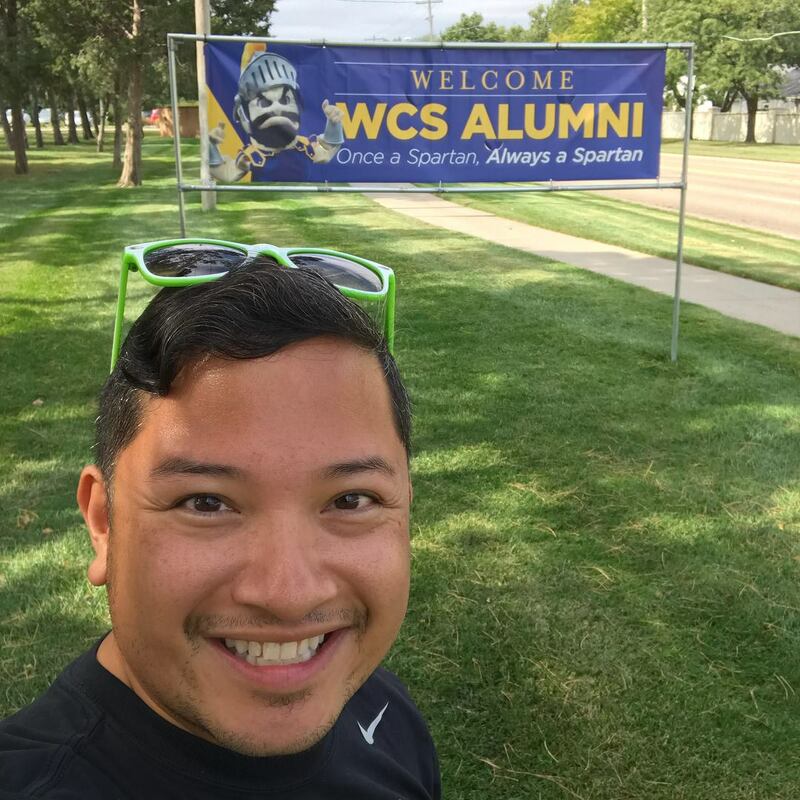 We turned left onto Seminole Street and began a two mile route through the neighborhood, with a number of architecturally-significant homes built in the early 20th century. 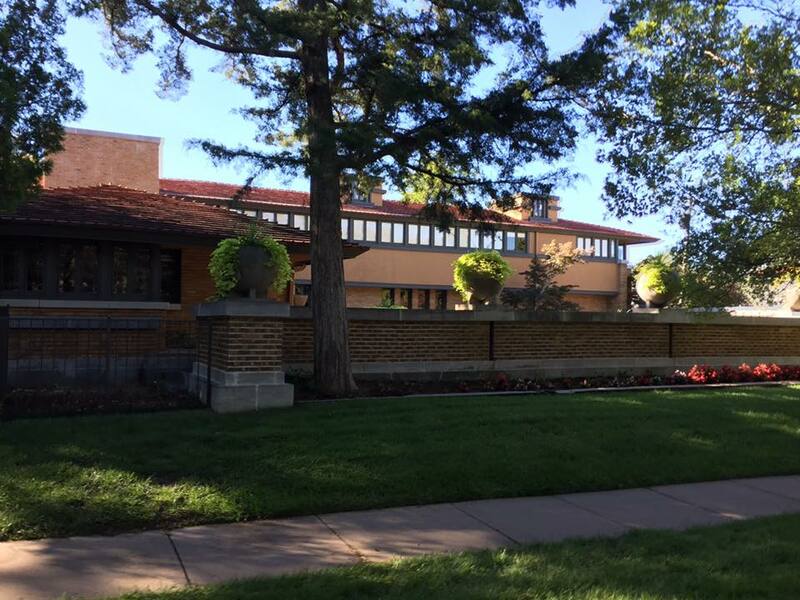 Many of these beautiful homes, some with quite large floor plates, were built by prominent architects, such as Albert Kahn, Louis Kamper and William Stratton, for some of the area's most prominent citizens, such as Edsel Ford. I began to strike up conversations with fellow runners during this stretch, as we were entertained by spectators who put up makeshift aid stations, some with beer (finally!) 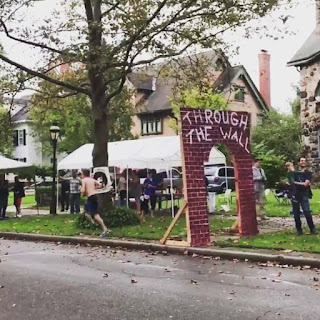 We made our way to the northernmost part of this stretch of the course at Goethe Street, and ran two blocks before making our return back to south along Burns Street, at one point even getting to run through a fun "Through the Wall" gate that a resident put up in front of his house. 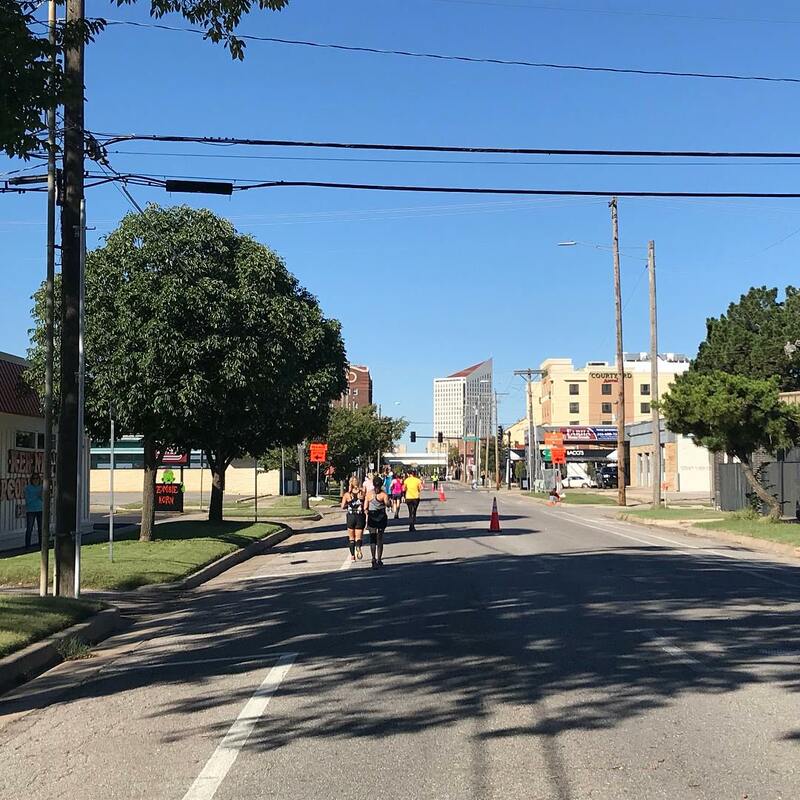 At the 18.5 mile mark, we turned right and found ourselves on the very wide Jefferson Avenue and running right into a strong headwind. The fact that the street was so wide and no tall buildings blocked the way made forward progression very difficult. 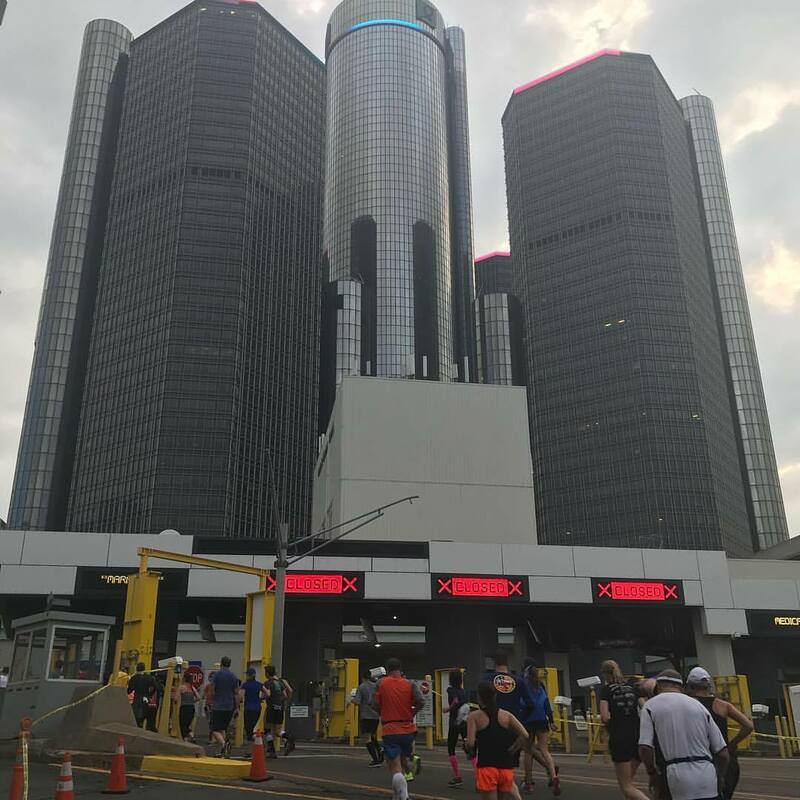 Add to the fact that we all were starting to get a little worried; in the distance, we could see the RenCen, with a dark cloud looming over it. We were directed into the center lane of the avenue, running along this windy section for just under a mile, until we moved toward the left shoulder of the road, running alongside the outer edge of Gabriel Richard Park, as we made our way down MacArthur Bridge onto Belle Isle. 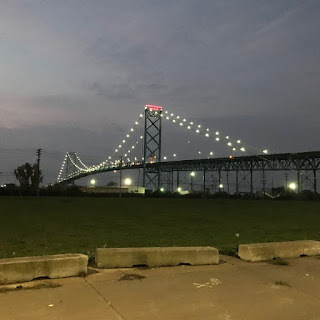 The flat bridge was not nearly as long as the Ambassador Bridge or even the tunnel, but presented its own challenges, as the forecasted wind began to rear its ugly head as we crossed this nearly 100 year old river crossing. There was no headwind or tailwind - rather, the wind basically brew from all directions, swirling as we gingerly made our way across. Belle Isle is a 1.5 square mile state park and is the largest city-owned island park in the United States. 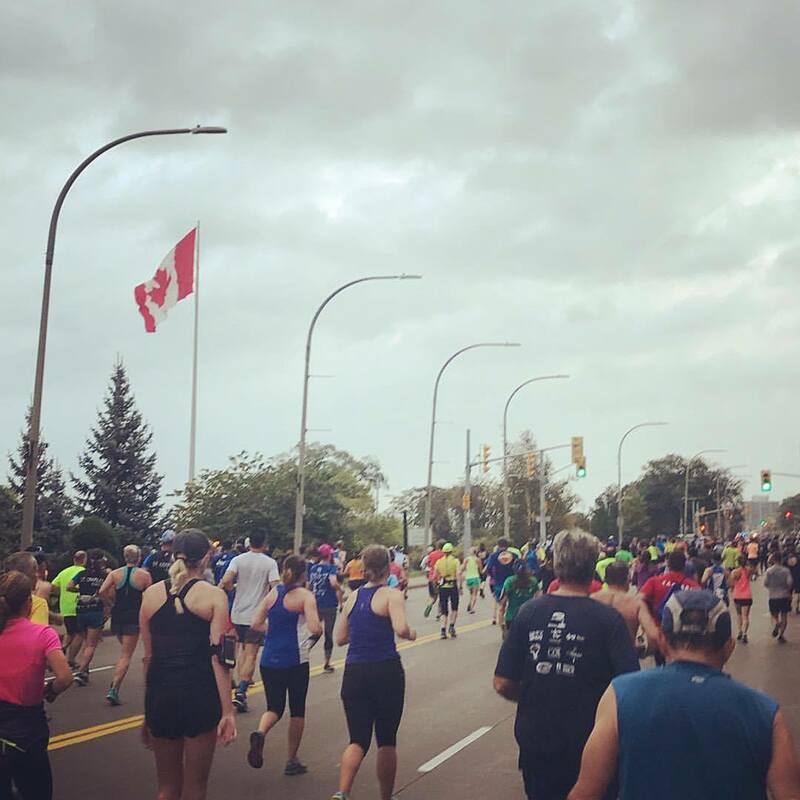 2.5 miles of the race ran along a road that cuts through the middle of the island, as well as the ring road that encircles it. Along the way we ran by the Belle Isle Aquarium; the Belle Isle Conservatory, a greenhouse and botanical garden; and the James Scott Memorial Fountain, a fountain designed by architect Cass Gilbert and sculptor Herbert Adams. 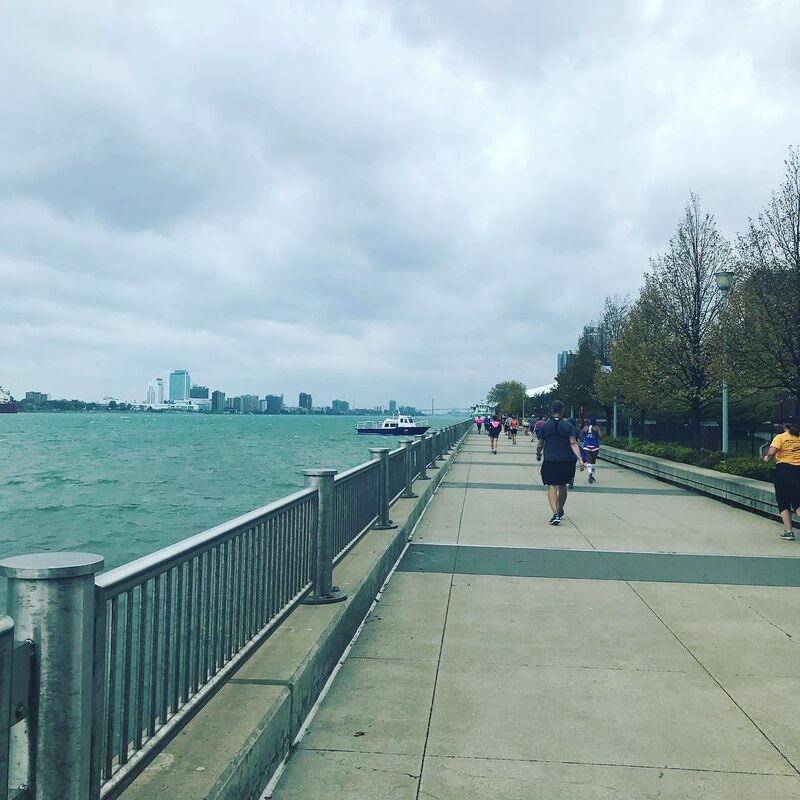 As we ran along the "backside" of the island on the Detroit River, we experienced some of the strongest gusts of wind during the entire race, peaking at 40 mph at times. It was interesting though, to look at the adjacent lake to our right, and not see much of the surface of the water affected by the wind - it was completely overgrown with algae and other plantlike to cause it to look completely still or covered with some sort of film. As we curved our way back toward the bridge, the wind stopped churning for a few minutes, but before long, it was back to its old self. We re-crossed MacArthur Bridge back onto the other side of the bank, and continued along Jefferson Avenue southwestward. We passed the 23 mile mark, and only had a 5k left to go. It was around here where runners were asked to move to the left, as the leaders of the US-only Half Marathon, which started 3 1/2 hours after our race, were sprinting down the same route. It got a little more chaotic as more of these fast half marathoners began to come up the street, as there were no separate lanes for them, and it was already getting difficult to navigate the narrower streets with their leaders speeding past, and us marathoners nearing the 5-hour mark shuffling by. 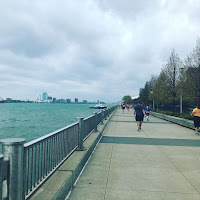 About a mile of the last 5K went along the Detroit Riverwalk, a promenade directly on the river's edge. At times, the wind was relentless as we ran here. It seemed every time we were close to the river in this second half of the marathon, we ran directly into the strong headwinds that were expected during the race. The clouds were still covering the sky over downtown, especially that big grey one over the RenCen. 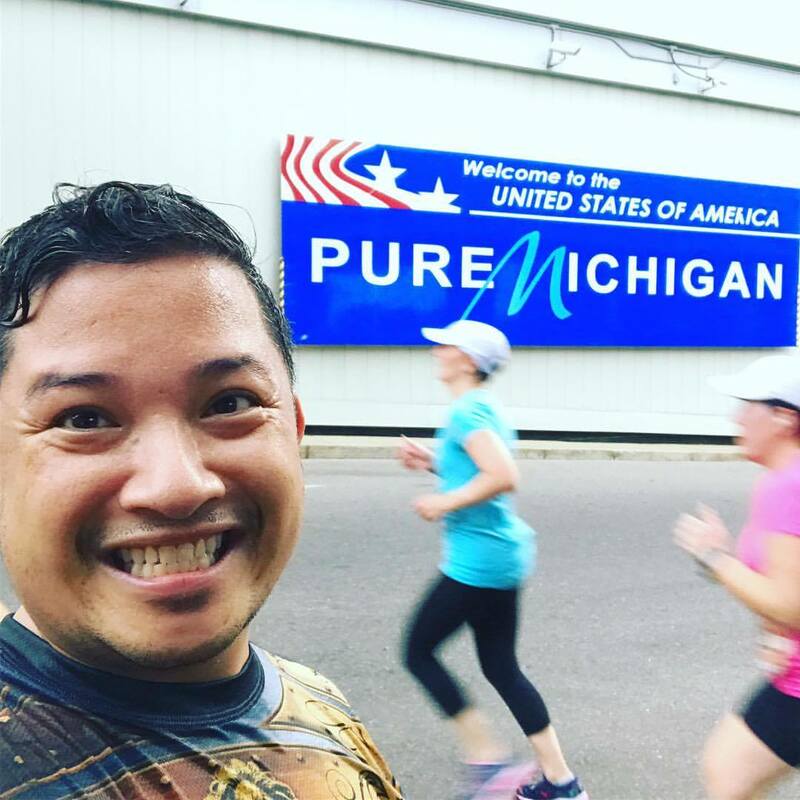 With only a couple miles to go, we left the Riverwalk and ran along Atwater, passing a few marinas and riverside parks. One last hill took us up Rivard Street back to Larned Street, which we took all the way into downtown Detroit, as the crowds began to re-form along the streets to cheer the marathoners in. 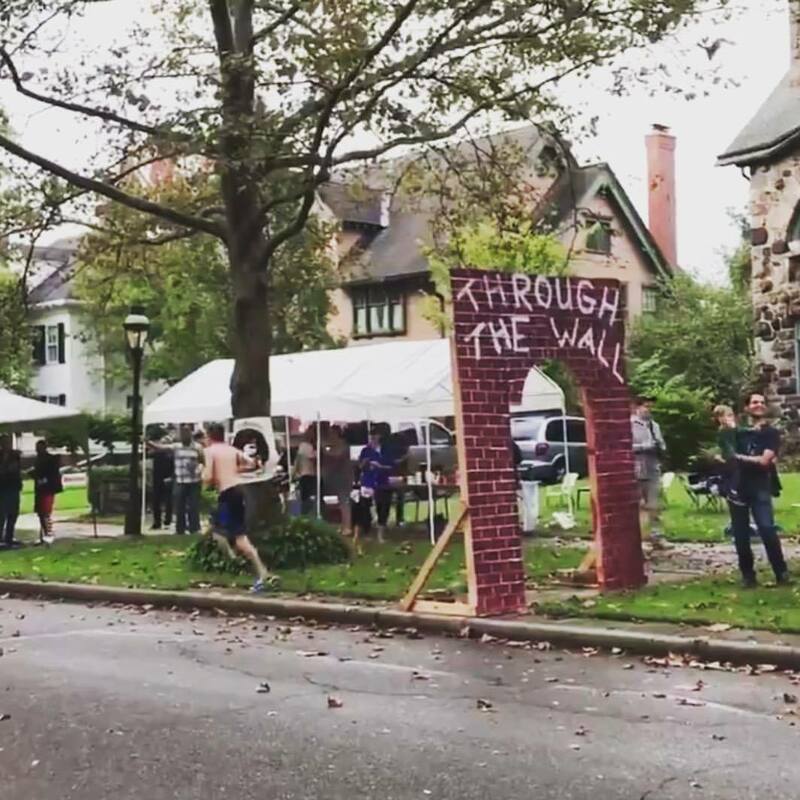 Before long, we were making our last right and left turns, and we were on Fort Street with the finish line gates in our sights. Running into the wind right through to the end, I crossed the finish line in 4:54:40, another sub-5 hour marathon under my belt. After the race, I headed over to the post-race party, known as "Conquered," but the wind was so strong, and I didn't have any cash on me, so I didn't partake in any of the food or activities there. The wind was coming in quite strong by that time of day, as some tents were nearly blowing away. 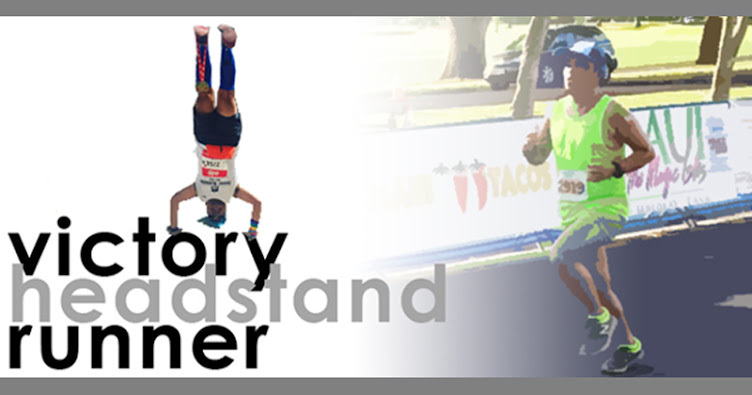 I did get to meet Dave, the start line coordinator who I had only been in touch with via email and never got to meet at the expo, and he took me in his golf cart to where Nicky was stationed at; I had her take my Victory Headstand photo, just as some light rain started to come down. I headed back to the Westin to shower and get my things together, and Lynn and Donna came up after they finished their respective races not long after each other. After checking out, we walked over to the Rusted Crow, a downtown gastrolounge with some great food and drinks and cool ambience. Andrew met up with us, before we headed back to get our car and make our way to the airport. I was so exhausted by the time we were at DTW; as soon as we got into the plane, I conked out and woke up as we were landing in New York a couple hours later. Bling + exhaustion = sleep like a rock on the plane. I was supposed to sing the national anthem and run the Prairie Fire Marathon in 2016, but ended up having to defer my entry to 2017 because of a cousin's wedding happening on the same day here in New York City. Thankfully, the race director, Bob Hanson, was kind enough to move my entry to the following year, as well as me singing at the start. My backbib for my milestone race! As luck would have it, my race schedule evened out in a way for me to reach my milestone 50th lifetime marathon at the 2017 Prairie Fire Marathon. It was very exciting, as I would be able to have my parents there to help me celebrate. The weather reports the week prior did not look too promising, with thunderstorms forecasted to wreak havoc in the area. As the weekend approached, the weather reports changed, and we were slated to have very nice weather on race morning - maybe a little warm, but nothing awful. ...except, Friday night, I was supposed to leave New York City to fly to Kansas City, where I would meet up with my friend Seth, flying in from Fort Lauderdale. Over the course of the day, my flight ended up getting compounded delays, ultimately becoming two hours delayed by the evening. 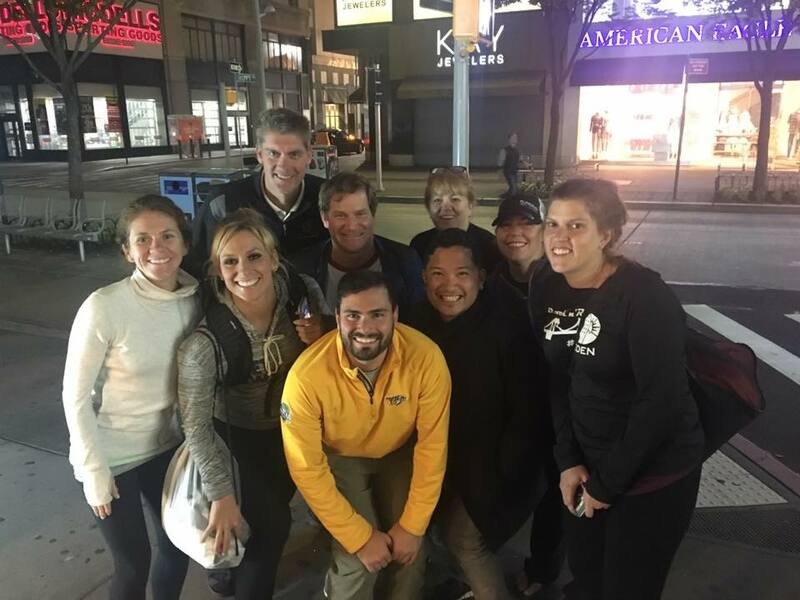 The flight landed in New York late, and we waited with bated breath before being able to board, after the plane had fully deplaned and the crew (brand new, and only slated to fly that route that night) got onto the plane to get ready for us. The gate agent then announced boarding, and first class passengers (myself included, as I was upgraded) were able to board. 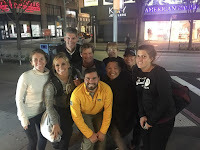 However, less than five minutes later, the twelve of us sitting in First ended up having to deplane, as air traffic control in Kansas City grounded our flight due to inclement weather in that area. The flight would now not leave until the following morning. I immediately got onto the phone with the Delta Platinum Medallion customer service line and was able to confirm tickets for a flight the next morning taking me directly to Wichita, where Seth would meet me. 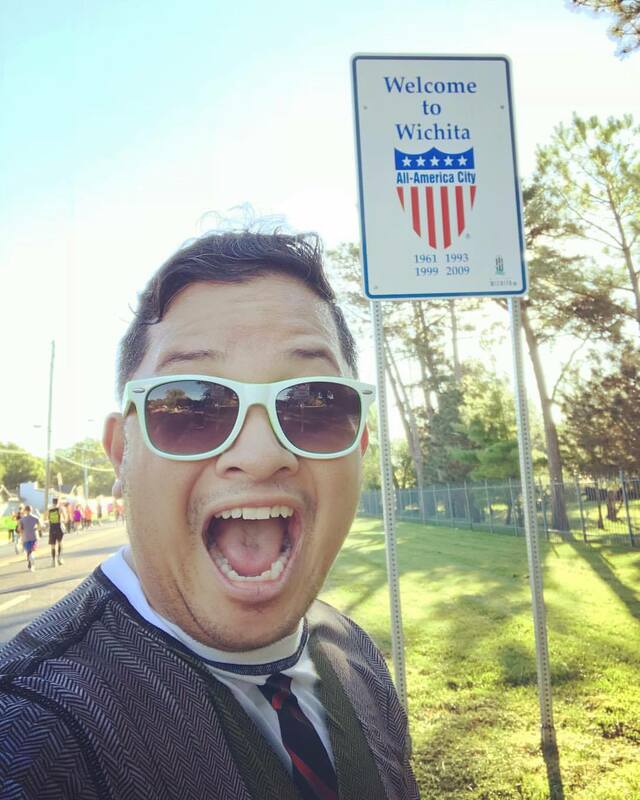 However, all of the earliest morning flights were fully booked, so I was ticketed for an 11am flight through Minneapolis, ultimately arriving in Wichita at 4:30pm. Knowing that a routing leaving LaGuardia at 6am through Atlanta would have me land in Wichita at 10:30am, I chanced getting on the 6am flight on standby, hoping to snag a seat that could get me to Atlanta to take the 9:30 flight that definitely had open seats to get me to Wichita. Thanks to the gate agent Wilfredo, I was able to snag the last standby seat on the plane, which was (lucky me) an exit row seat, and I was the last one to board the flight. I got to Atlanta on time and headed over to my connecting flight, where I got upgraded to First Class at the gate on the MD-88 headed to my hometown. to from Preschool to 12th grade! Landing in Wichita was a breeze, and it turns out, Seth was able to time his arrival perfectly (despite traffic on US-54 due to installation of bridge beams at the interchange with I-235 over the weekend) so that he could pick me up straight from the airport. 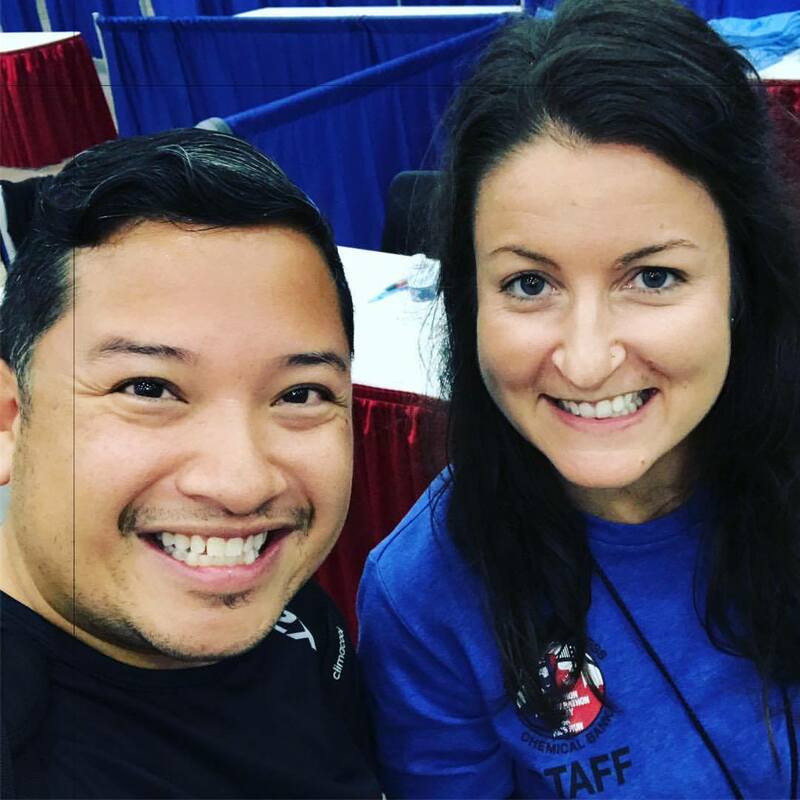 Another running friend, Cade, was on the same ATL-ICT flight, and he was picked up by a couple other running friends (Glen, Todd, and Karen), and we all headed out to the expo at the Century II Convention Center Exhibition Hall in downtown Wichita. At the expo, bib pickup was a breeze, and I got to meet the race director (who invited me and my friends to the pasta dinner that night) as well as his social media director, Lacy. Timed perfectly was also seeing my longtime friend Hannah and her family; Hannah and I came into running right around the same time, and she had a big goal to break the 2-hour mark in the half marathon on Sunday. I also got to give Hannah's mom Pam a huge hug - she had been receiving treatment for pancreatic cancer (Sadly, in March of 2018, Pam passed away.) 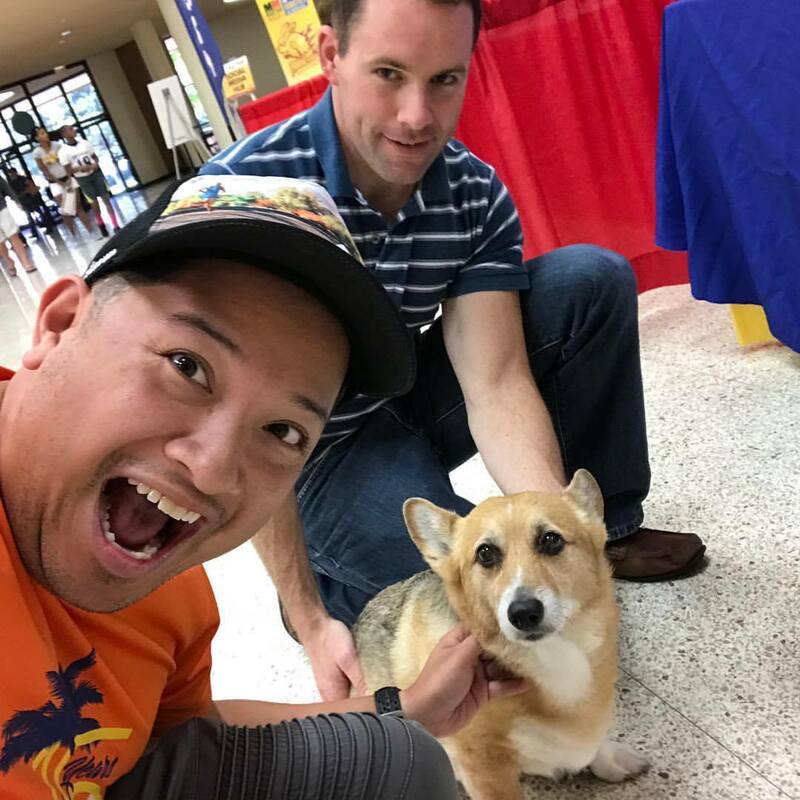 I also got to meet Ross Janssen from the KWCH Storm Team, and his 13 year old corgi Millie, who my mom is a big fan of. KWCH Meterologist Ross Janssen and local celebrity Millie! 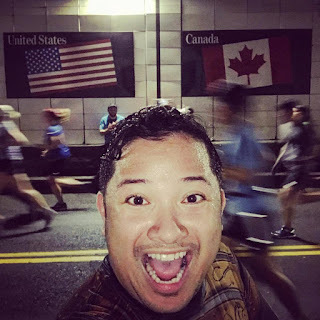 We were all pretty hungry, me and my group of friends from out of town headed into Old Town to grab a bite to eat at Rain, a cafe that doubles as a gay bar during the evening (unbeknownst to my friends who made the decision to eat there.) After a great lunch chatting amongst our group, Andy, Seth, and I headed over to Dillons to grab some groceries, before meeting up with Jeanette and JC, my Filipino friends from New York, who were finishing up lunch at a Vietnamese restaurant not too far away. 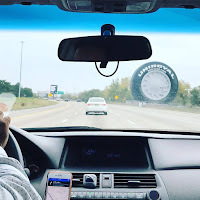 They were taking Ubers all around town, so we picked them up to take them to Delano where we would meet up again with the rest of the crew to hit up AeroPlains Brewing as well as take a look at the Delano Fall Fair happening in that area that weekend. We followed that up by one more brewery, Central Standard Brewery, before we headed back downtown to the Hyatt Regency to join in on the pasta dinner. The Pasta Dinner was a fun event. 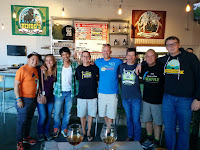 Bob told me to bring whoever I wanted, so Jeanette, JC, Andy, Joe, and Seth joined me, and it was a nice way to hear each other's stories - some folks running their first distance race, others well into their hundreds. 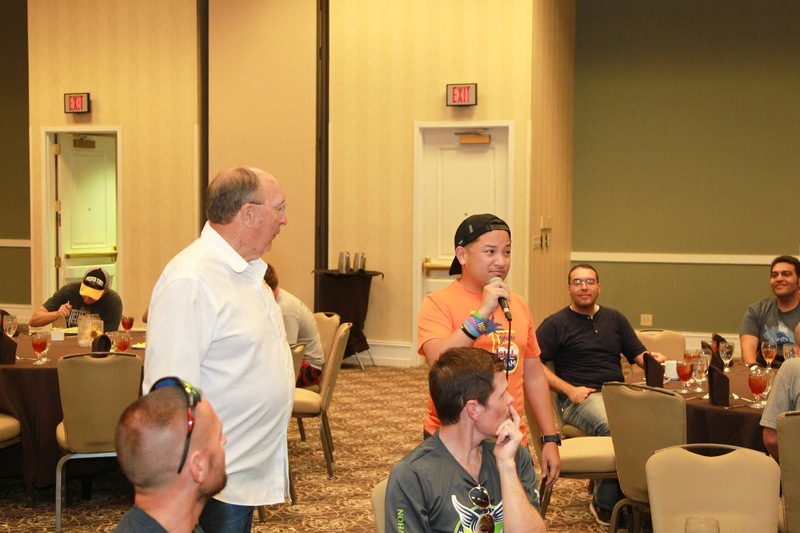 It was also a great way to inspire each other to continue running after Sunday's race. Among those at the pasta dinner included Phillip Fields, a 50 state marathon finisher (as well as DC and the 10 Canadian provinces) who has been running marathons while under treatment for leukemia since his diagnosis in 2007, and continues to run to raise funds for research and treatment of pediatric cancer through Nemours, a children's health system based at locations in Delaware and Florida; as well as Paul Gavriani, a fellow New Yorker, aiming to complete 50 states, 50 countries, and 7 continents of marathons. As the dinner ended, the crew went off to their hotels, while Seth and I drove to the east side of town to finally head to my parents' house to crash for the night. 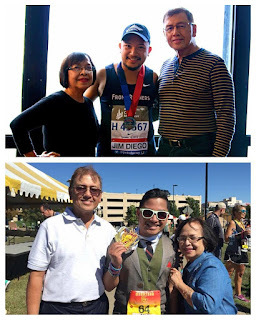 After introducing my parents to Seth, and settling in, I gave my parents the lowdown of the course, and my anticipated time of arrival to a spot on the course near where they'd be at already for Sunday morning mass at our longtime church, St. Thomas Aquinas. The course ran in a residential neighborhood behind the church, so I told them to meet me there after 9am, around the time I assumed I'd be approaching mile 11 1/2. That night, I slept soundly in my childhood bedroom, conking out at 10pm after a wild 24 hours of travel and socializing. We woke up around 5:30 the next morning, and my dad had woken up as well, preparing some coffee for Seth and I before we left. We were out the door before 6am, and were easily able to find parking at the Waterwalk condominiums just to the east of the start area. 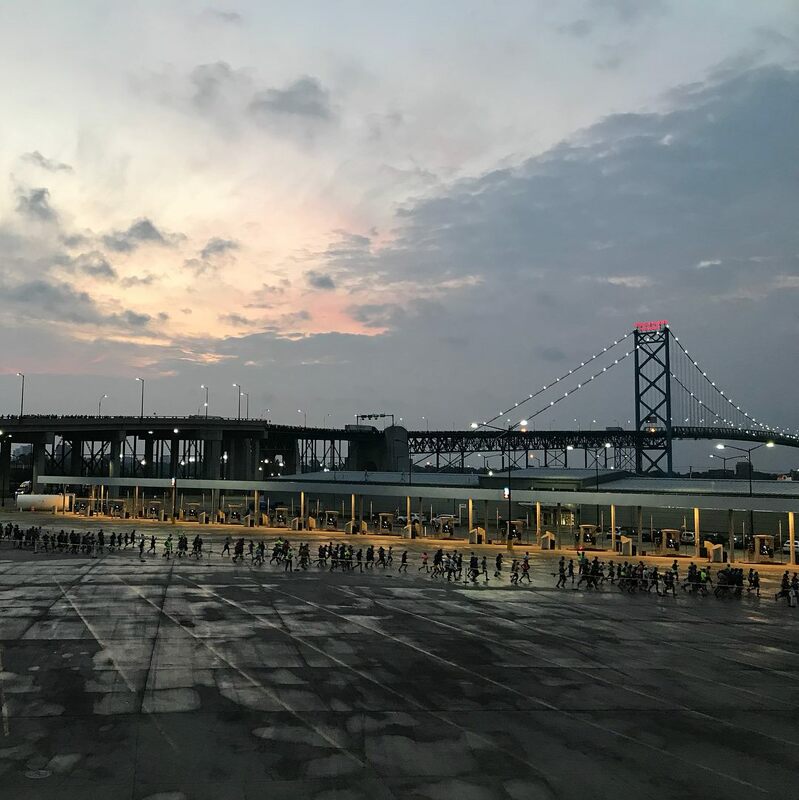 It was a chilly morning, and runners were just beginning to arrive. 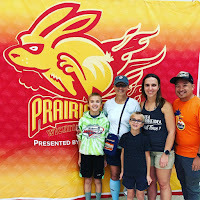 We warmed up with a little more coffee provided by aptly named PrairieFire Coffee Roasters, a local roaster, while I waited in the start area for Joe, a reporter with the local CBS news station KWCH TV, to arrive. 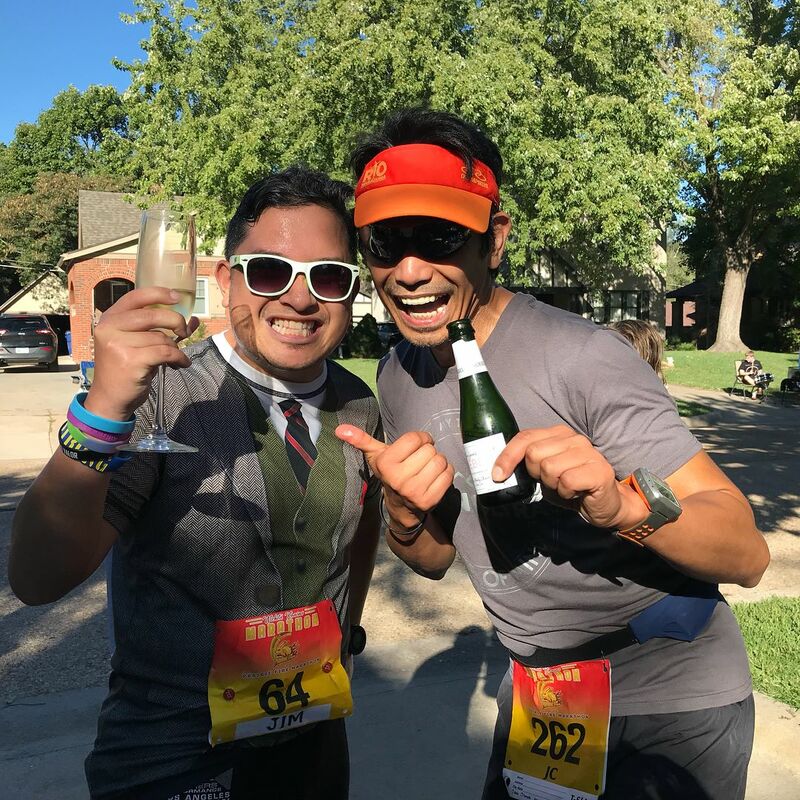 We found each other at about 7:05, and got me mic'd up with the start/finish line on Waterman Street in the background, as he asked me the interview questions before the speakers got too loud with pre-race amp-up music. Soon enough, it was time for me to get to the start for the national anthem, but before then, I spotted my longtime family friends Brian and Ching, who woke up early to come downtown to hear me sing and cheer on the runners as we started. I gave Ching my phone to take video of my national anthem. 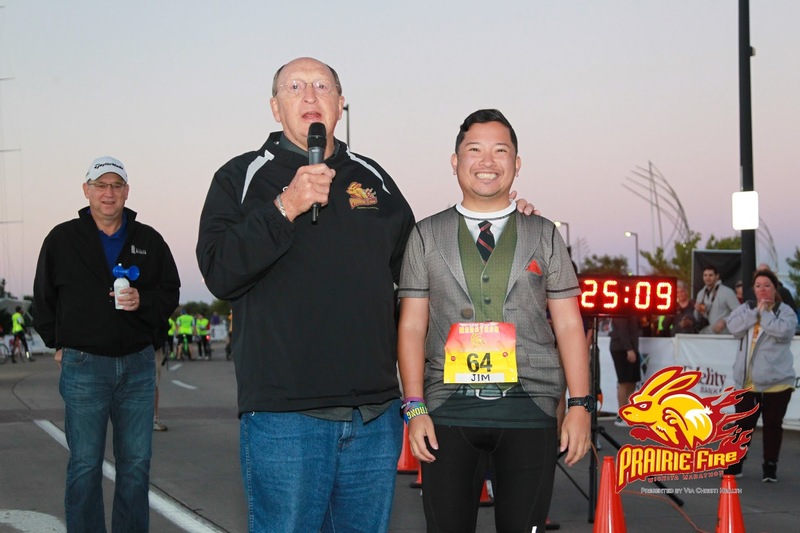 A little after 7:20, Bob spoke some, introduced Wichita Mayor Jeff Longwell, and then handed the mic to the start announcer, who introduced me before I sang the national anthem. 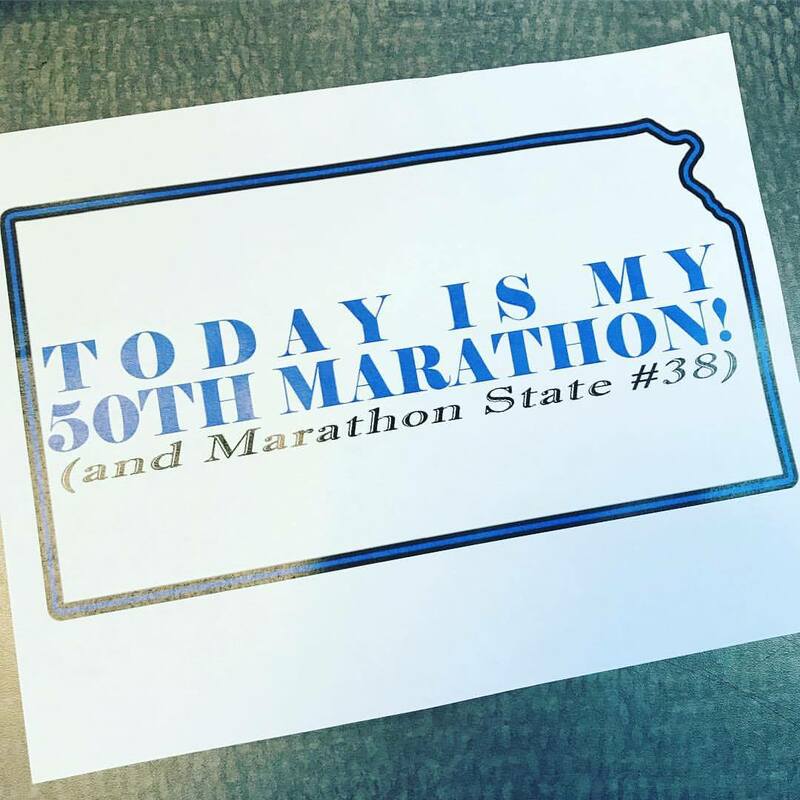 Bob even stepped in to remark that this was going to be my 50th marathon, and that I was a hometown boy returning for this milestone race. I sang one of my proudest national anthem renditions (despite the prolonged beeps coming from timing chips being too close to the start mats) and then headed back behind the startmats to find Hannah and her husband Noel, situated with the 2:00 half pacers, before we were off promptly at 7:30! Immediately, we crossed the Arkansas River and turned right, making our way up McLean Blvd. 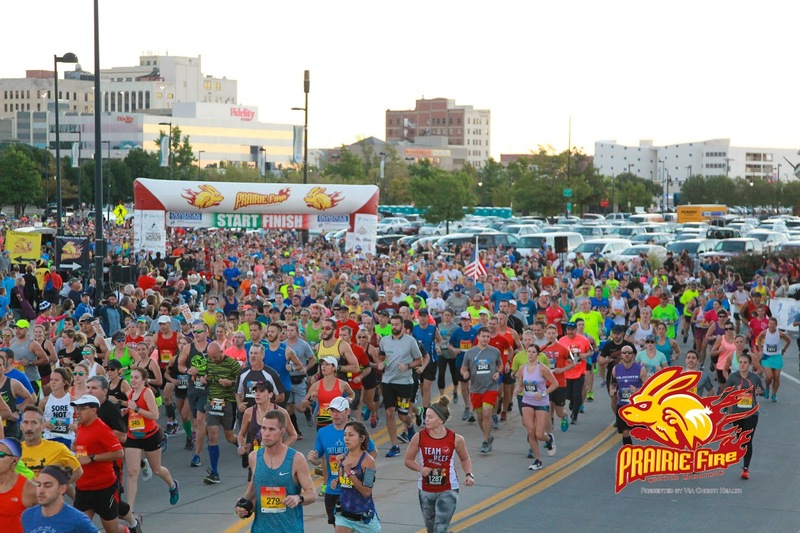 It was a little crowded with everyone around us jockeying for space, but we kept up the pace alongside the 2:00 pacers as we passed Lawrence-Dumont Stadium. The speakers blaring music were lined up all along McLean, so we could hear them for nearly half a mile. We'd turn right again as we crossed back over the Arkansas River, heading east on Douglas Avenue, Wichita's dividing line between the north and south parts of town. 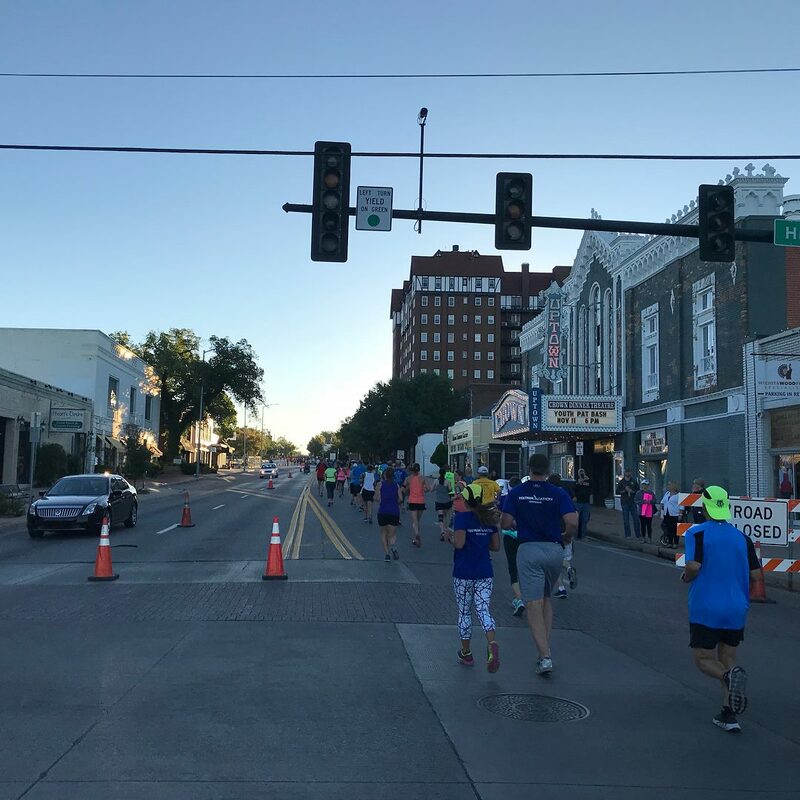 It was surreal running along Douglas; I've driven or been driven over this street for so many years as I grew up; I even remarked that to Hannah, as she nodded, focused in on keeping her pace early on in the race. This would just be the start of my familiarity with the major streets of the course. We passed several downtown Wichita landmarks, including saucer like Century II and the noticeable glass-and-block facade of the former Bank of America Financial Center (now called the Ruffin Building) - both buildings I have performed in at several points in my performing "career" as a kid and as an adult. 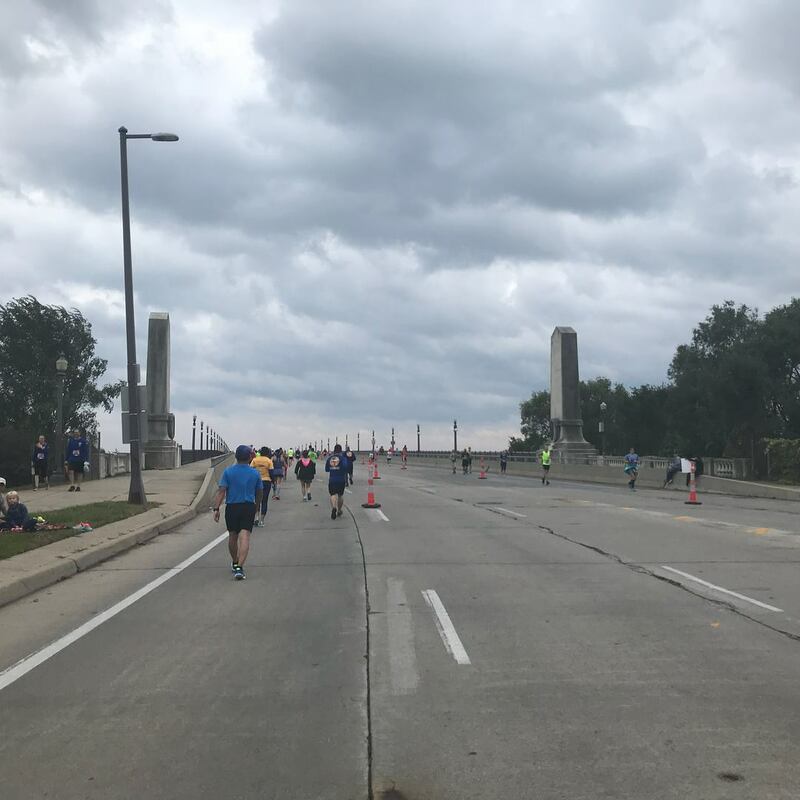 We hit the 1 mile mark and were ahead of pace, clocking in an 8:52 mile; considering that 2:00 is an average 9:09 pace, the pacers were definitely going a little faster than they should have. 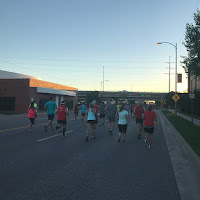 I continued to keep up as we continued east and made our way underneath the elevated railroad tracks that demarcate Wichita's Old Town neighborhood. To our right, we could also see the massive Intrust Bank Arena, its presence a newer fixture in the downtown skyline. On the out-and-back on Grove St. The Great Plains Jazz Orchestra was out playing some great music in front of Larkspur Restaurant as we passed by, then it was only a matter of time before the orange cones became right next to us, as we filtered ourselves through the construction traffic that apparently had popped up only in the few weeks before the marathon. It continued for a few blocks, and would only a be a nuisance as we passed Hydraulic Avenue and the mile 2 mark, a slower 9:10 mile, but still on pace. 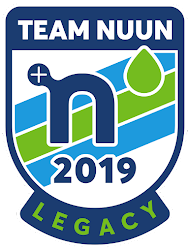 I took my walk break at the 19 minute mark, sending all my best to Hannah and Noel as they soldiered on, with 2:00 in their crosshairs. The orange cones were not out for long - they would be all but gone by the time we passed underneath I-135 and on the other side, Wichita East High School. At Grove Street, we made a right turn, and proceeded to complete an out-and-back section that would take us past Kellogg to a turn around point and the ability to see other runners and friends along the way. The mile 3 mark was just before the turn around, and we hit the 5k mark at roughly 29 minutes. Strong time for me, and my legs still felt good. Before long, we were back at Douglas, and continued our eastward progression, with the high point of the race still yet to come. In fact, we could see it in front of us - the red roof of the Hillcrest Apartments, an 11-floor apartment building built in 1927 in the Tudor Revival style, and rumored to be the first high-rise cooperative apartment house built west of the Mississippi. It stands just past Hillside Street, which marks the western border of the tony residential neighborhood of College Hill, made up of homes built between 1900 and 1934. Just after Hillside is also Crown Uptown Dinner Theatre, 1920s-era vaudeville theatre established in 1977, considered to be one of the Wichita area's most beloved and unique venues, and a theatre I would go to when I was a kid for children's productions! This is also the steepest hill of the race, rising only about 50 feet at the 4 1/4 mile mark. It's also right across the street from the building I went to for dental appointments all through childhood, where my family friends owned an orthodontics practice. We turned right onto Clifton Avenue and began our curvilinear trek through residential neighborhoods of College Hill and Crown Heights. We rounded College Hill Park, heading eastward along Lewis Street, crossing the busy thoroughfare of Oliver Street, eventually finding ourselves on the backside of the Dole VA Medical Center on Waterman Street, still heading east. 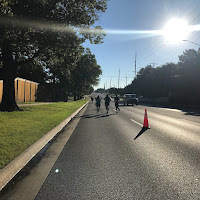 We crossed another busy thoroughfare, Edgemoor, before heading northeast along Ridgecrest for the last section of course before separating from the half marathoners. They continued straight for a couple more blocks before heading back west, while we continued on eastward, turning a slight right onto Lynwood Boulevard, a road that would cross Woodlawn and take us directly into Eastborough. Folks from out of town wouldn't realize it, but as soon as we crossed Woodlawn on Lynwood Blvd, we were entering another city. 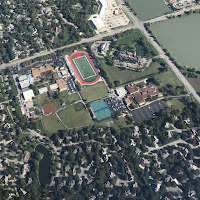 The city of Eastborough is considered a suburb of Wichita, and is completely enclosed by the city. 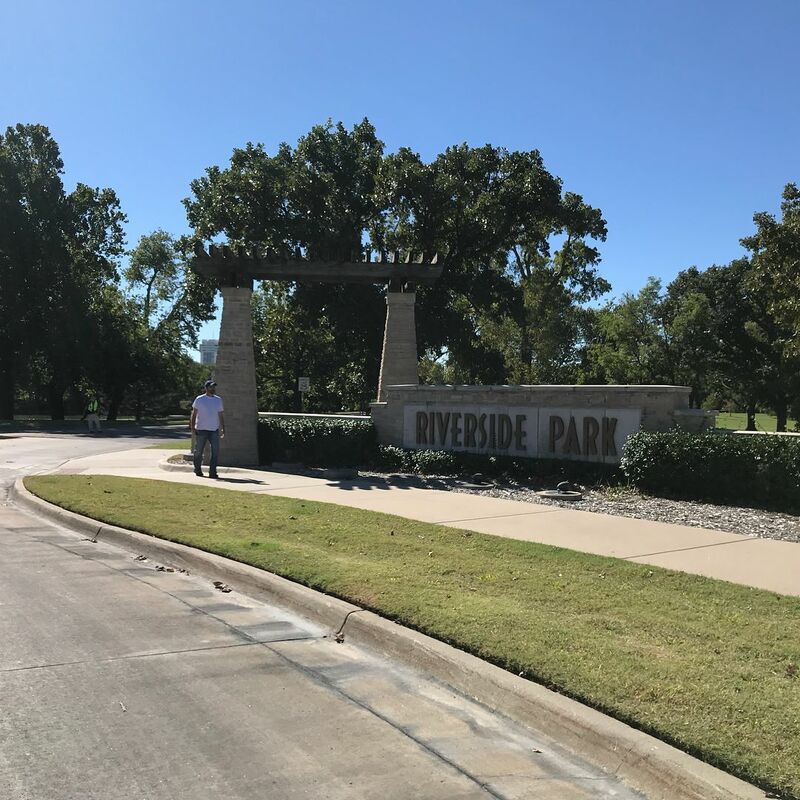 Envisioned as a quaint English village on the Kansas prairie, development began in 1929, and it was incorporated as its own city eight years later. With a small population of 760, Eastborough relies upon Wichita for water purification and sewage treatment, but has its own municipal government (a mayor and five council members), and police force of seven officers. Those from the area know of Eastborough's "infamous" reputation of being a dependable speed trap, as the speed limit crawls down to 20 mph along its main thoroughfare of Douglas from 35 on either side of the city's boundaries. As soon as we crossed Douglas, I exclaimed, "slow down, we're in Eastborough now!" to the laughs of locals who knew of the reduced speed. We continued down Lynwood before turning right onto Hampton Road as it headed southwestward toward the lake in the lower corner of the residential area. Behind the lake was a 10 foot high masonry wall that was erected in the early 2000s, as Kellogg Avenue, a major freeway through the center of the metropolis, required demolition of a row of homes abutting it on southern border of Eastborough. The construction threatened to destroy the picturesque pond that served as an attraction and gathering spot, but thankfully, it was reconfigured and redesigned in order to maintain its landmark nature. We would cross over the curb and head around the water feature before ending up on the other side of the lake, following Lakeside Boulevard on a northeasterly direction. After crossing up Mission Road, we ended back on an easterly route along Douglas, before exiting the city and reemerging in Wichita city limits. Running down Central. So surreal. We turned left onto Rutland, curving our way northward along Armour, and turned right again onto the main thoroughfare of Central Avenue, a street I've been more intimately familiar with having driven on it on a daily basis while growing up. We were on a nice downhill stretch running into the sun before we turned once again through a residential neighborhood. Along the way, we passed the former corner home of a family friend, one with a recognizable circle drive which brought back memories of parties I attended as a child. 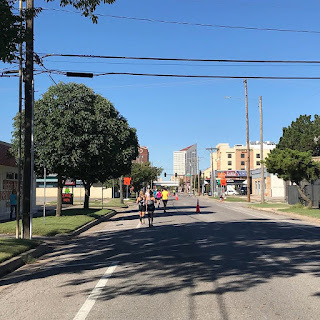 Eventually, we made our way on East Wichita's busiest street, Rock Road, and the furthest east part of the course. We had seen the single lane blocked off as we drove downtown this morning, but now we were running on the section of Rock - probably THE road I am most familiar with. Now running here was super surreal to me! 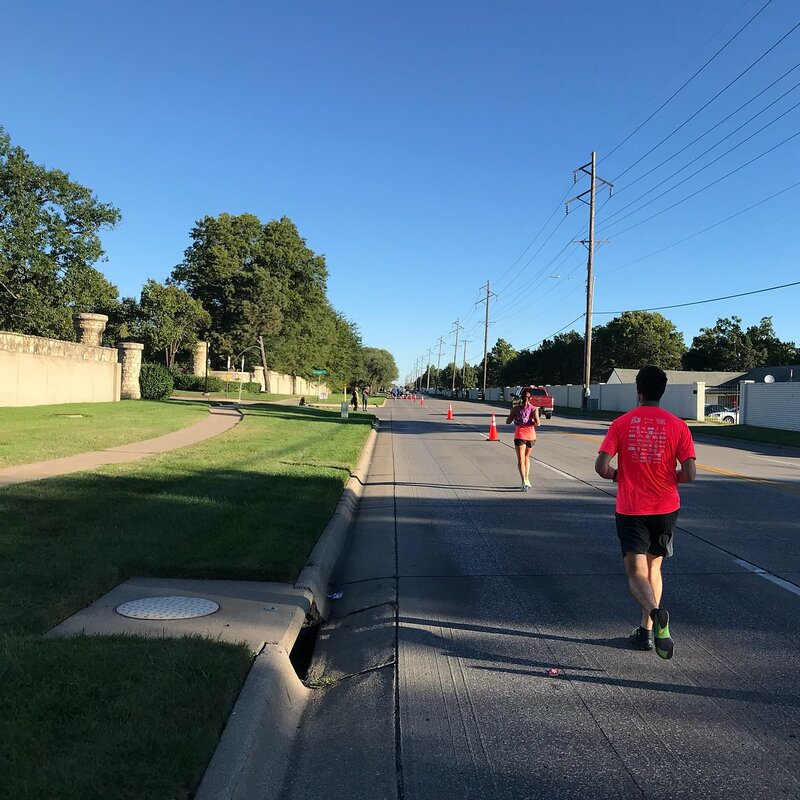 This section of Rock Road was pretty short, as it was only 1/4 mile, before we turned left back into the residential neighborhoods along Polo Street, and into a business park where a rock band was playing music for the runners. 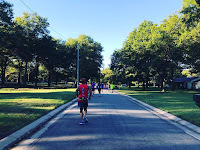 We would weave through the neighborhood for about 1.5 miles on various curvy streets, as well as along a path that cut across a small creek that fed into a lake further south. 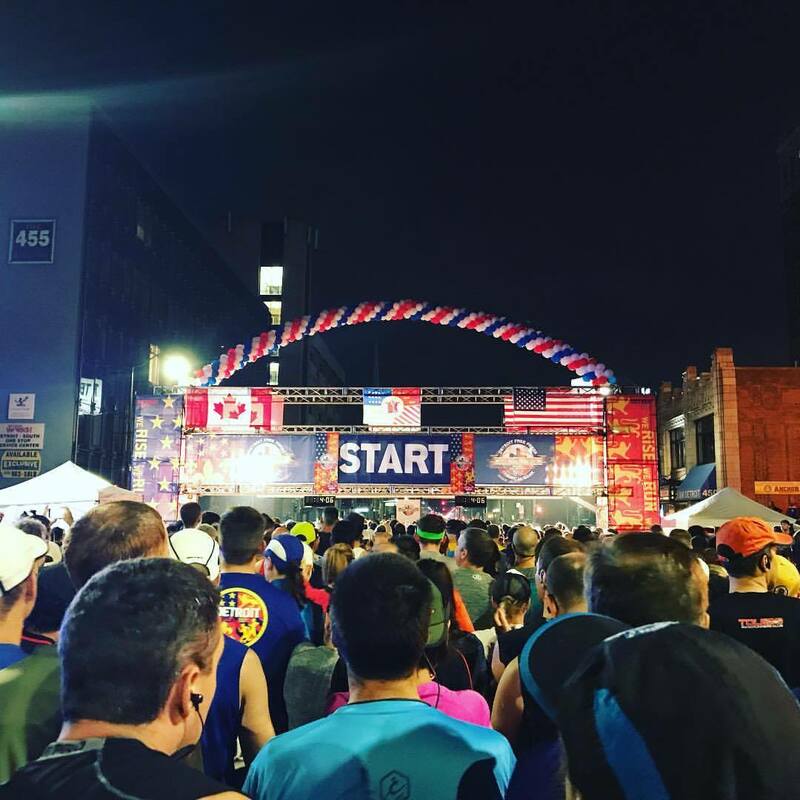 On Whitfield Street, we began to run northwestward then westward, and I knew that at 11th Street, my parents would be standing there to see me along the course. 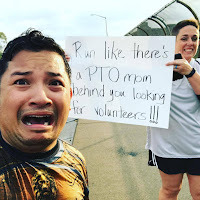 As expected, they had attended church and then positioned themselves along the course at 11th and Whitfield, and they were there waiting for me with phones in hand taking video... mom on her iPhone, and dad on his flip phone. Yes, dad was taking video on his ancient flip phone, something I had no clue was capable of taking video. After a quick group photo, I continued on, and they promised to see me at the end at after the noon hour, roughly 4.5 to 5 hours after my start. 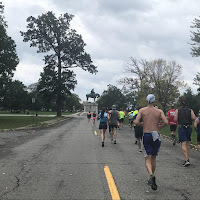 I continued to soldier on, and proceeded further through the various residential streets, then made my way along the northern and western edges of Edgemoor Park as we headed southward on a mile-long straightaway that would cross over Central Avenue. We would be back on Douglas, heading westward though, and a familiar looking shirt was in my view just in front of me. By then we had passed the halfway mark of the race, and not only did I see JC in front of me, but Seth had joined in as well. Together, we turned right onto Dellrose, and then came upon a family having brunch on their driveway while watching the race... JC and I ended up coming up and asking for champagne, which they gladly poured for us! It was actually quite good champagne, but needless to say, we had to stop a few more times over the next mile to quell the heartburn feeling we were experiencing. The three of us took our time as we began our westward trek along 2nd Street, which would take us all the way back to downtown Wichita. As we conservatively ran/walked forward, I pointed out some of the nicer homes of College Hill that we were passing, especially the Frank Lloyd Wright designed Allen-Lambe House. Jeanette would catch up as well, looking quite strong despite being only a couple races back from injury; I decided to keep the momentum going with her and posted a faster mile with her before finally reaching an aid station in order to take my first GU of the day, about 16 miles into the course, just after the underpass of I-135. 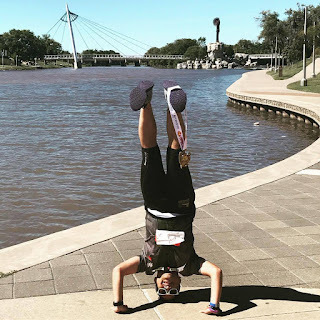 Jeanette continued on and would run consistent miles toward a strong finish. Heading west, with Epic Center and downtown in the distance. Over the next couple miles, I'd run-walk alongside Seth and JC, as we continued to head downtown, passing through Old Town, and eventually past the tallest building in Kansas, the Epic Center, finally reaching the confluence of the Arkansas River and the Little Arkansas River, as well as the roads that followed the curve of the river. As we passed the iconic "Keeper of the Plains" statue and the Veterans Memorials along the river, we would end up adding Oklahoman Shelly to our mix and we would take the next couple miles together as we made our way across the Nims Street bridge over the Little Arkansas River around the roundabout within Riverside Park, looping our way around the modest riverfront homes near the park. We of course would make sure to pose along the way for the photographer taking pictures along one of the out-and-back sections. stood there for over 15 years! 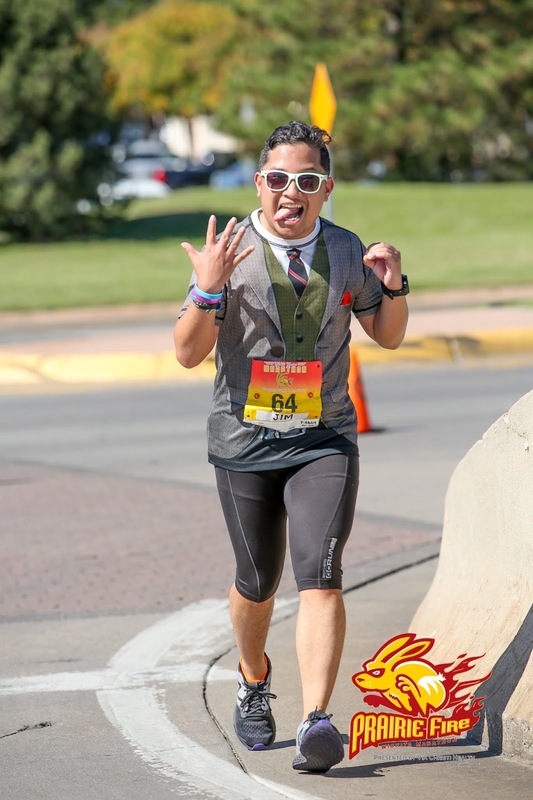 At mile 20, I decided to make a decision to soldier on forward alone for the remainder of the race, in order to solidify a sub-5 hour marathon in my home state. I said my goodbyes to the group, and I headed westward along Stackman Drive's curve toward the Wichita Art Museum, then took Museum Boulevard past the city's water treatment plant, Old Cowtown Museum and Botanica. 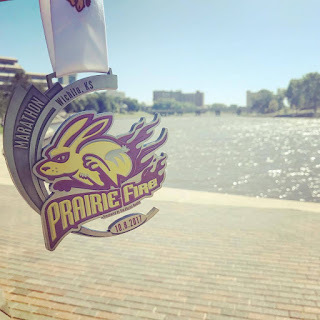 The course then curved counterclockwise around Sim Park Golf Course, including a fairly familiar long straight shot down Amidon, a road I remember running down during the Prairie Fire Spring Half nearly 3 1/2 years ago. 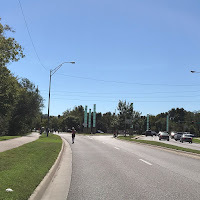 We then crossed 13th Street, and then had 5K left to go on a fairly long, curvy stretch of McLean Blvd all the way down to the Hyatt, following the curve of the Arkansas River. This also happened to be one of the windiest stretches of the course, so while I took my time to not over exert energy, I was also compensating for the headwind I was running into. Just a little over a mile left to go! Coming around the corner to the finish! 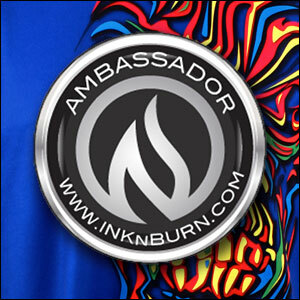 One step from the finish mat! 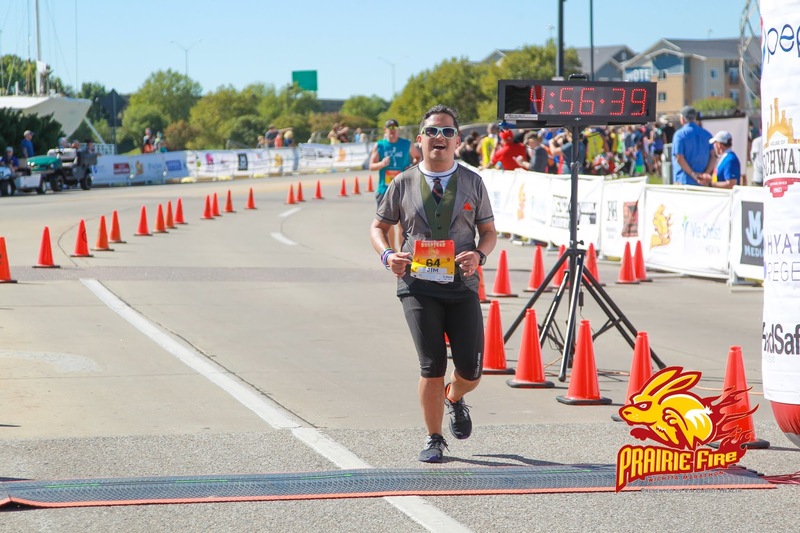 I progressed forward at a decent clip and knew I was well within a good time to run under 5:00. The wind was tough, though, so I don't know how much it was going to add to my time. Before long, the Hyatt was in view and getting closer, and I knew that the finish line would be just over the bridge we had run over in the beginning of the race. At 26 miles in, it would feel like quicksand. Andy was waiting alongside the course, hoping to run his friend Karen in, as I passed, and then I made the left turn over the bridge, pushing with all my might to make it over the uphill. I saw several other friends who had finished alongside the course, and heard my name yelled out over the speakers. 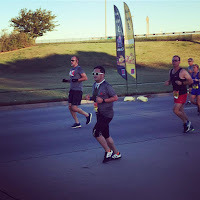 With 20 feet left to go, all of a sudden, my right calf began to spasm and cramp on me. 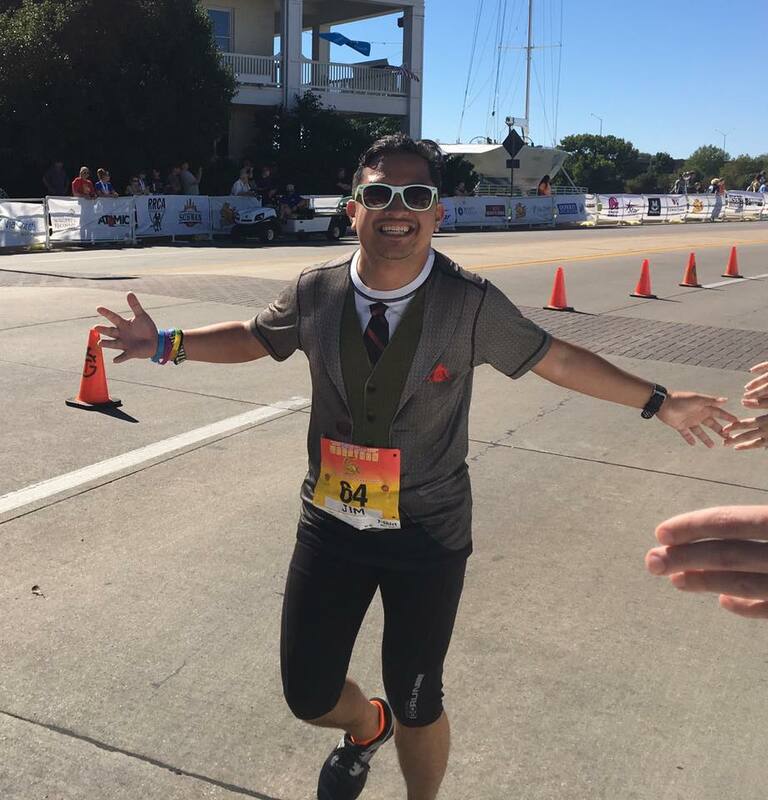 I hobbled over the line, finishing in 4:56:25. And for the first time, were able to have my parents see me cross the line at a marathon. 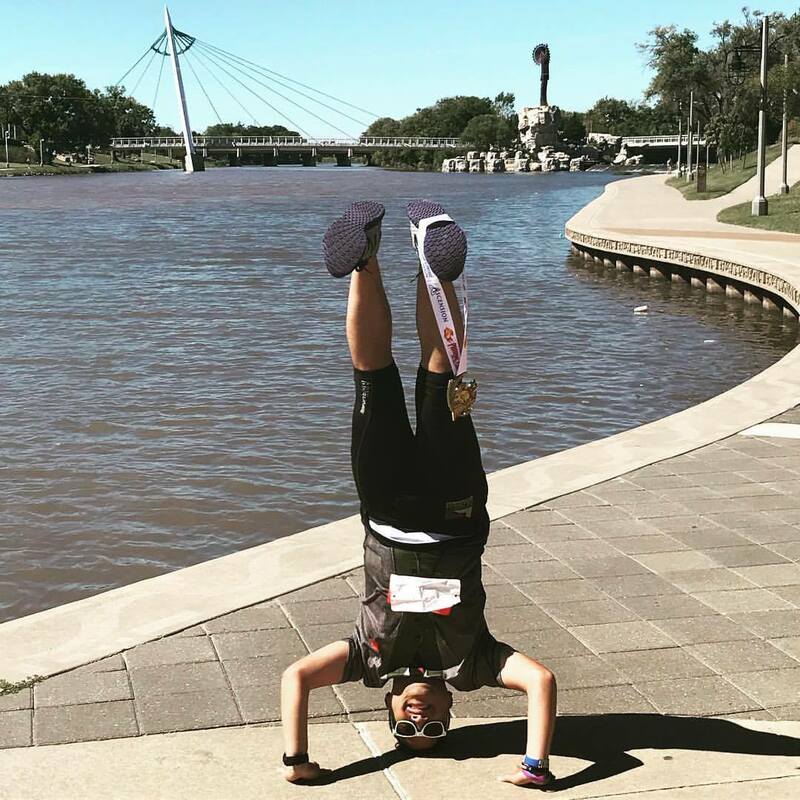 Victory Headstand with the iconic Keeper of the Plains statue! After the race, I waited for my friends to come through the finish less than 20 minutes after me, and met up with Melissa Murray from KWCH, who was there to greet me at the finish and take some more B-roll footage of me that would be used in the feature they'd show on the 5:00 news. 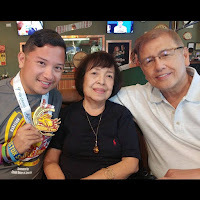 After getting back to my parents' house to shower, Seth left to drive back to Kansas City, and my parents and I met up with my cousin Flor at Wichita Brewing Company for a late lunch. We went back to the house afterward and caught the whole interview on TV, which can be found here. 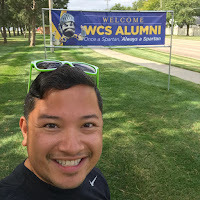 Since it was Columbus Day weekend, I had an extra day that I could spend in Wichita, so I met up with an old family friend in the morning for breakfast, in between picking up her daughters from their halfday programs at school - my old stomping grounds of Wichita Collegiate. I then spent the rest of the day wandering the halls of the school that I called home for 15 years - preschool through 12th grade. Homecoming would be the following weekend, so I would end up missing the big celebrations scheduled for Friday. I did, however, get in touch with the new high school vocal music teacher over e-mail, and got to sit in on rehearsal, which was fun! 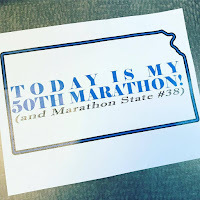 I had a 5pm flight back home to New York City, but thrilled to have done so much this weekend, especially completing my 50th marathon!